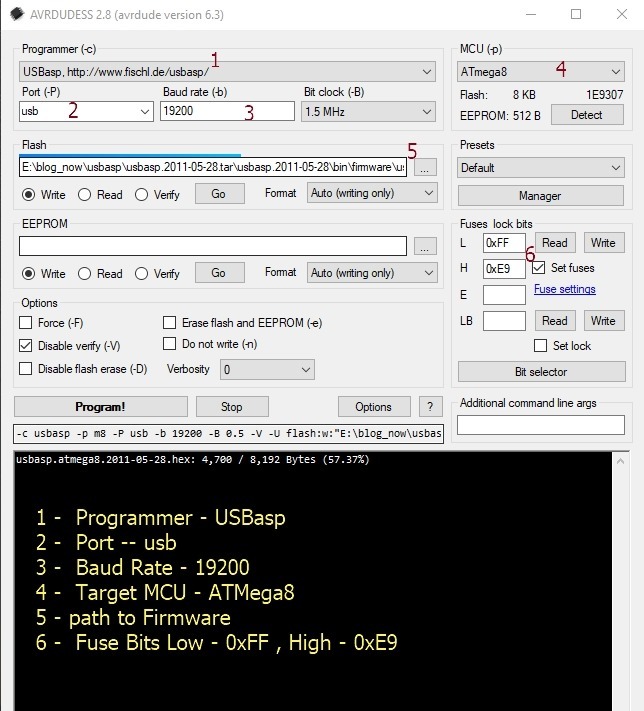 USBASP programmer is widely used to upload .HEX file on to AVR / 8051 ICs. On Windows 10 PC you may face some driver installation problems.Check out my previous blog on how to install drivers. 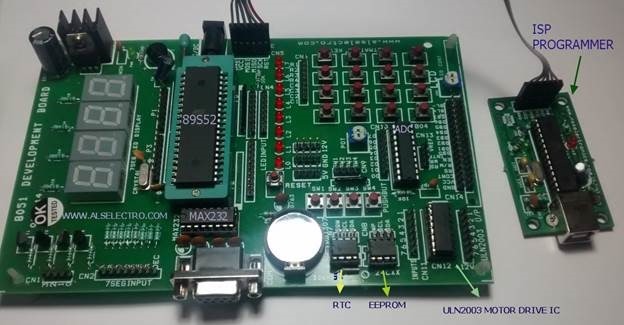 While connecting USBASP to 8051 development board , take care that GND pin matches GND of both boards. 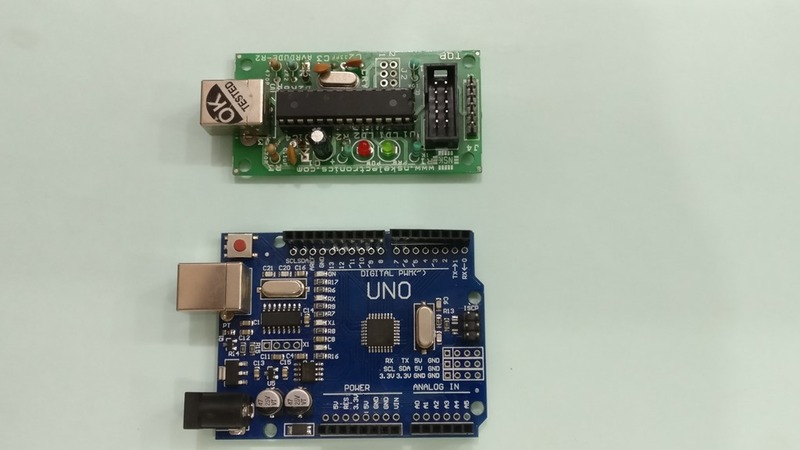 No separate power source required for development board.It can source from USB itself. 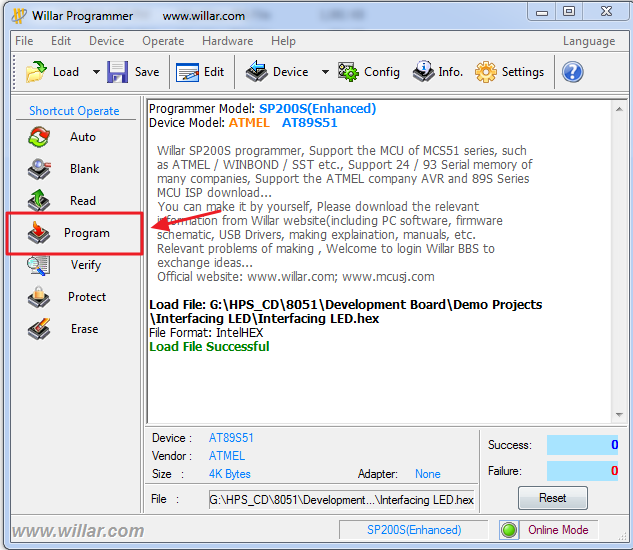 Connect USBASP to PC . 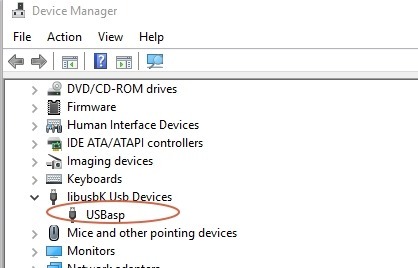 Once driver is installed , under Device Manager USBASP appears. 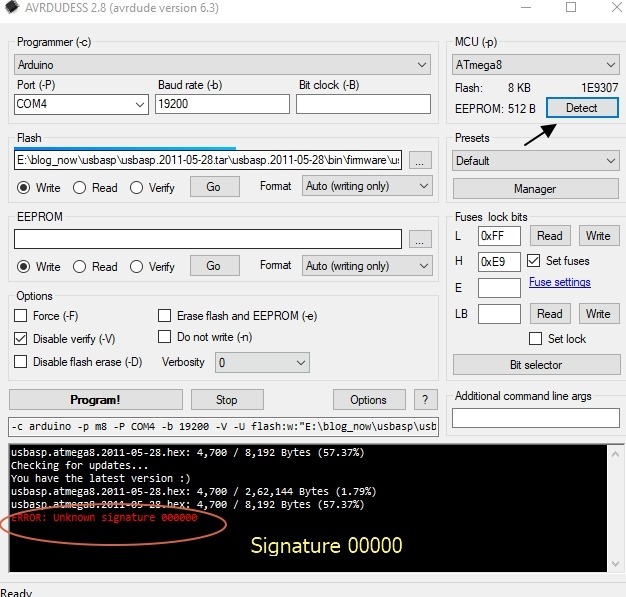 PROG ISP software IDE is used to upload HEX file on to 8051 IC. 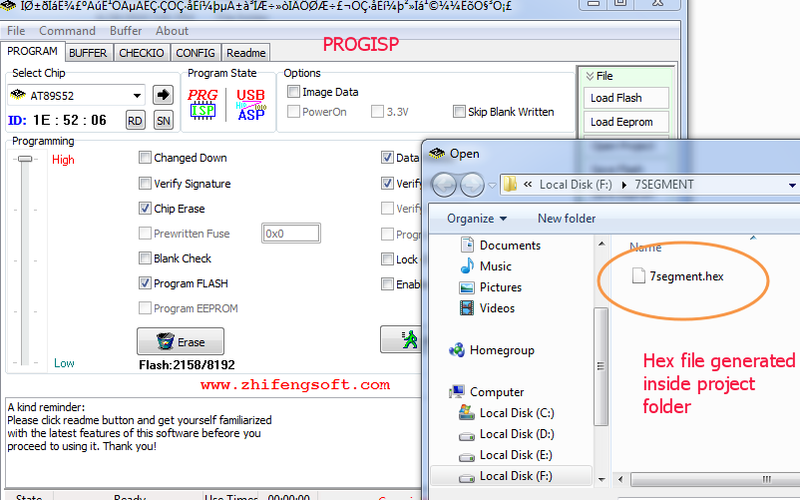 No installation is required.Unzip the downloaded file and double click on PROGISP application. PRG ISP will be greyed out if programmer is not found on not connected. 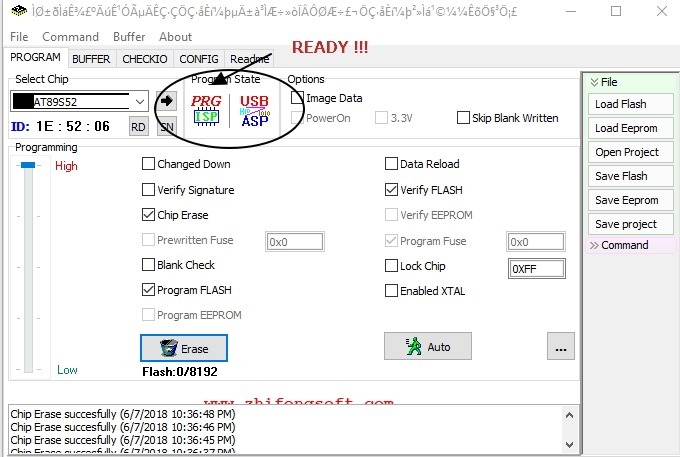 USB ASP will be greyed out if driver is not installed. Ensure that these two blocks are not greyed out. Select your IC from drop down menu. 89C52 or 89S52 , select the correct part no. 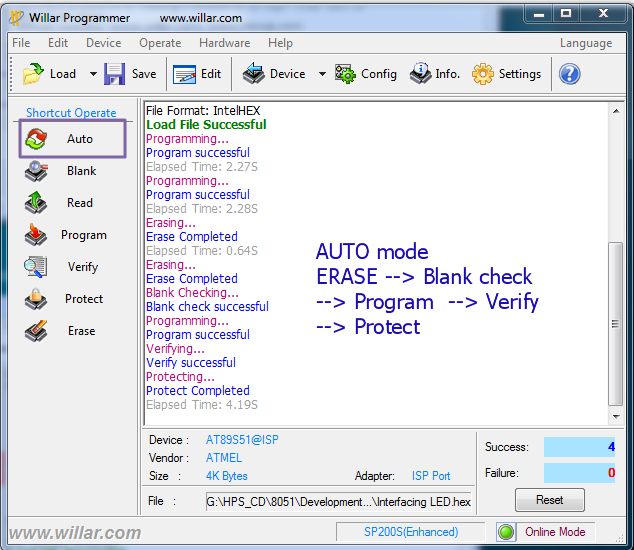 If the usbasp device is ok , the erase will be performed. 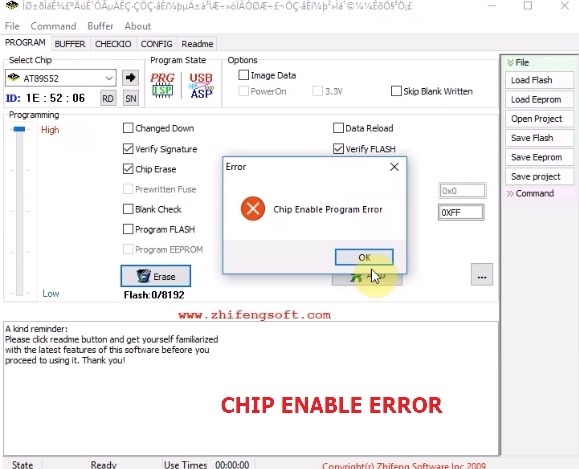 Here Im getting the infamous CHIP ENABLE Error. This error persists even after , Programming power adjusted using slider & Verify Signature tick mark removed . 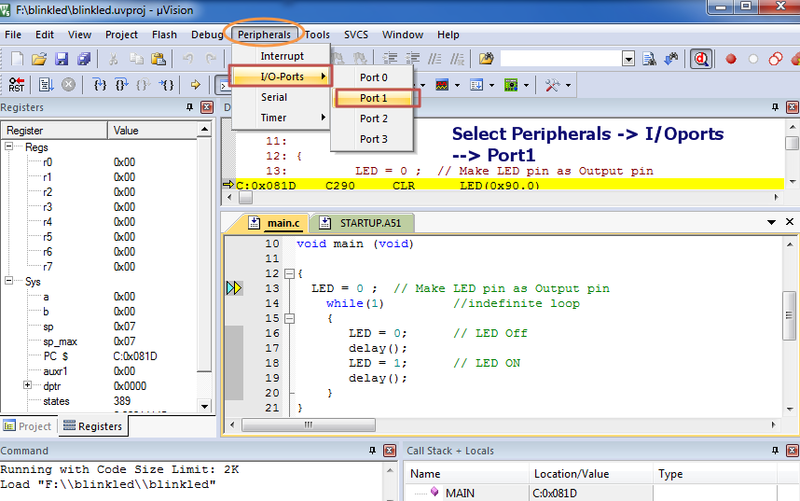 CHIP ENABLE error occurs if the IC is not placed correctly on ZIF socket of development board or if the wrong Chip is selected. 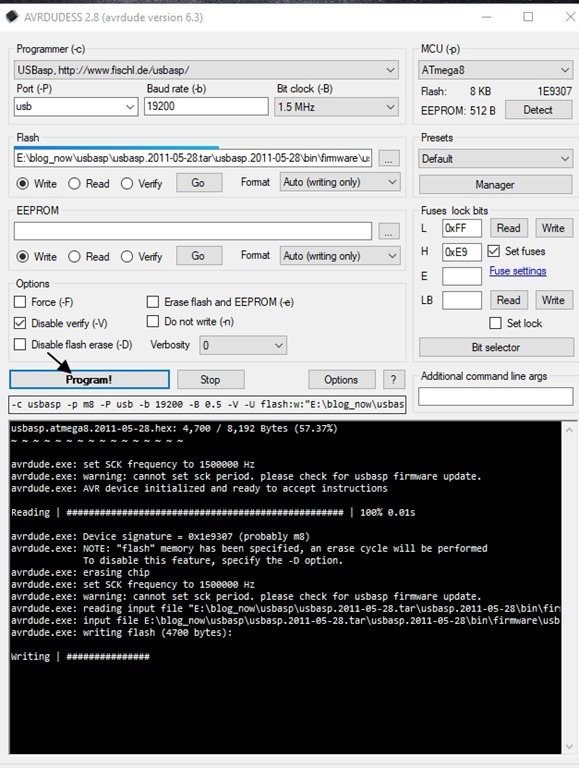 If still the problem persists , then you need to upgrade FIRMWARE of USBASP. For this we use ARDUINO UNO in ISP mode. 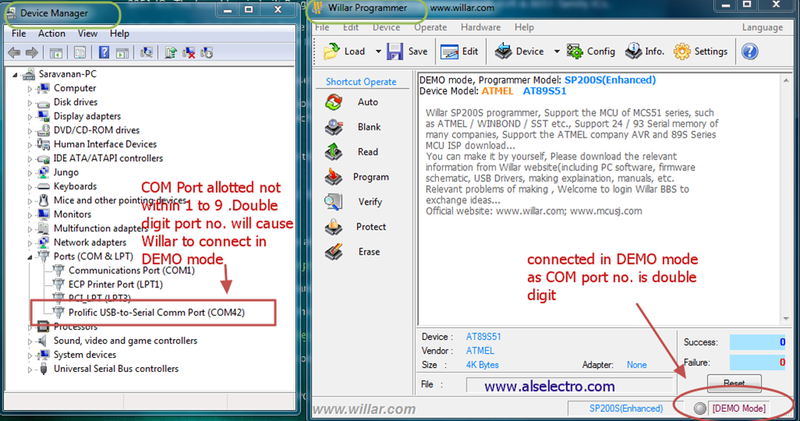 Connect UNO to PC & note the COM port allotted. 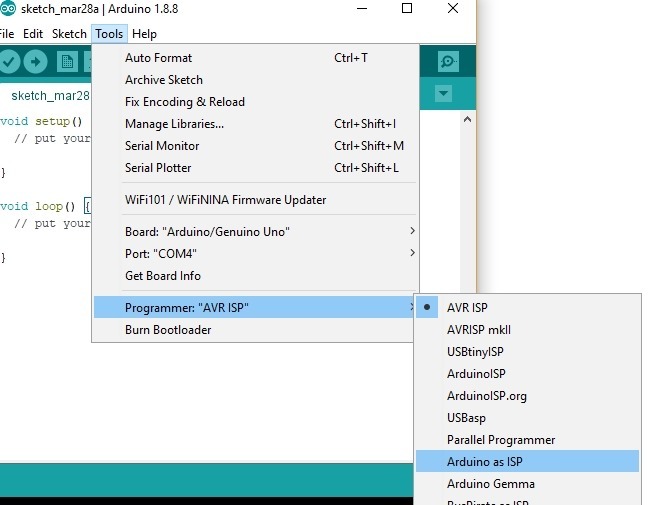 Programmer is selected as ARDUINO AS ISP. Upload the sketch. 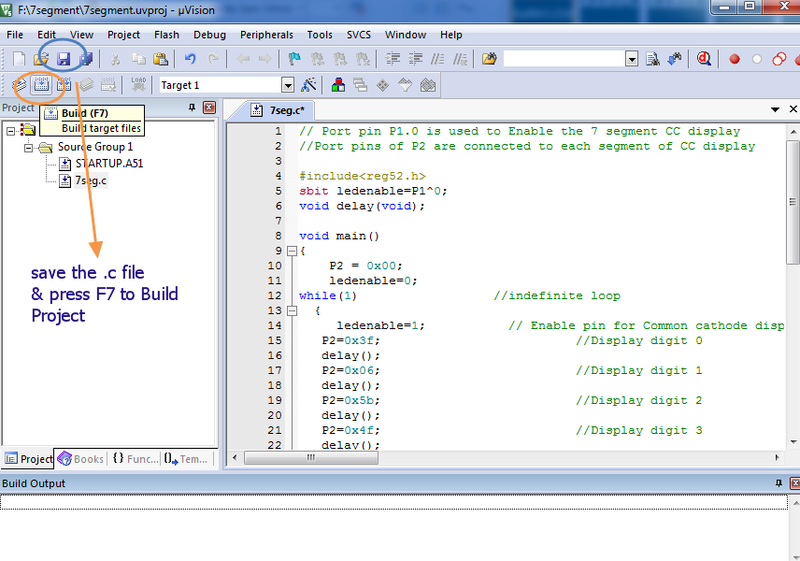 Now Arduino is ready as ISP programmer. Download the .tar.gz file & unzip twice. Under bin –> firmare you can see the Atmega8 firmware file in .hex format. 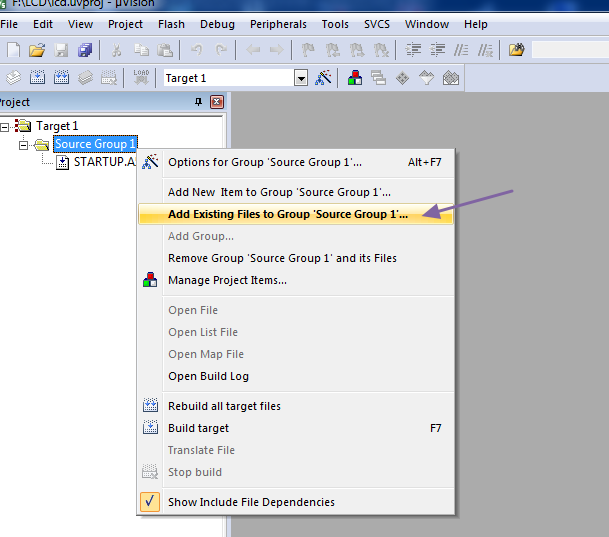 Note the path where this file is saved. Download it from link below and install it. Baud rate 19200 ,if you try any other baud it shows time out error. 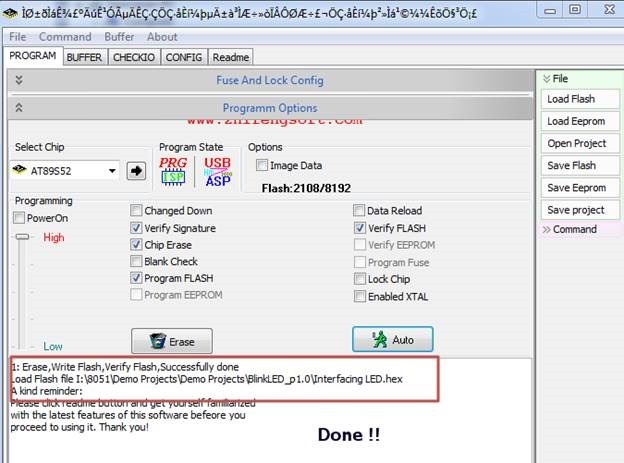 Under FLASH click on … and browse to select the firmware file we downloaded earlier. Fuses can be set as Low Fuse : 0xFF , High Fuse : 0xE9, select tick mark against SET FUSES. I get an error saying signature 00000 , which means target is not detected. 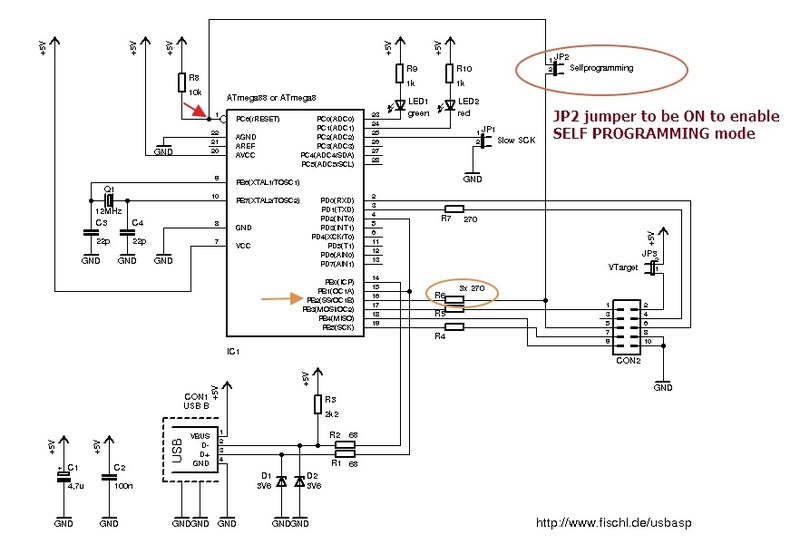 If you check the schematic of USBASP , a jumper JP2 is to be ON to enable self programming. This jumper is between pins 1 & 16 (slave select pin) of USBASP IC. As my USBASP is not having this jumper I soldered a 270E resistor between pins 1 & 16. Now I tried DETECT on AVRDUDES. 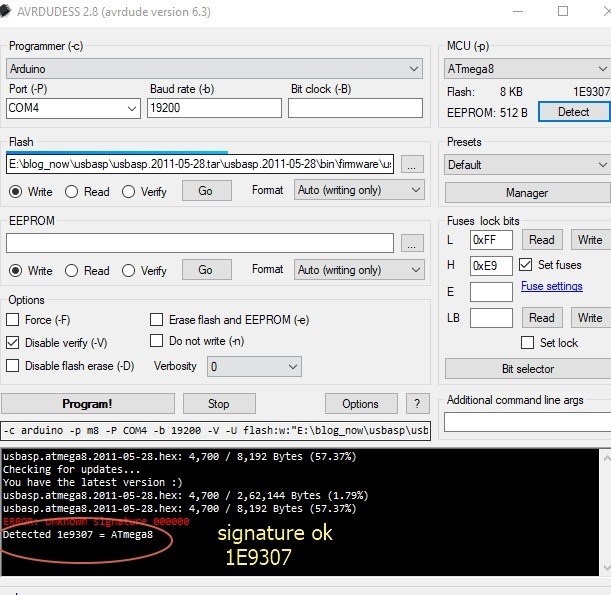 Target is detected & the signature of ATMEGA8 is 1E9307. Now on clicking PROGRAM button , the firmware is flashed successfully. I just removed the resistor and tried uploading hex on to 8051 successfully. Let us see the second method of upgrading firmware . 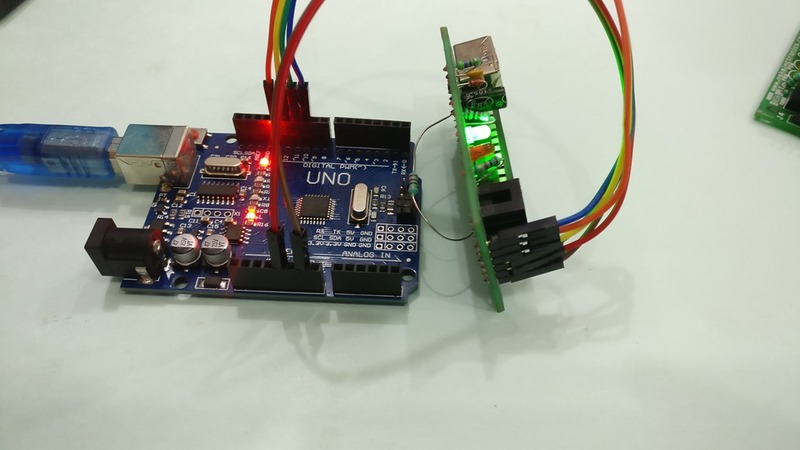 Here we use another working USBASP programmer instead of ARDUINO. On target USBASP a 270 E resistor soldered between pins 1 & 16. PC is connected to Master USBASP. Click on Program to see the firmware upgraded successfully. 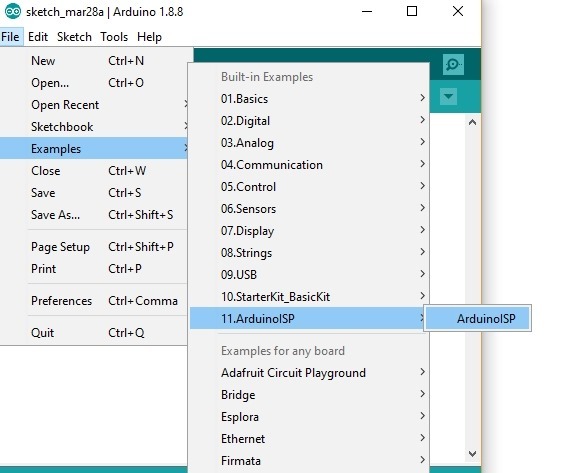 This method is slower than Arduino method. 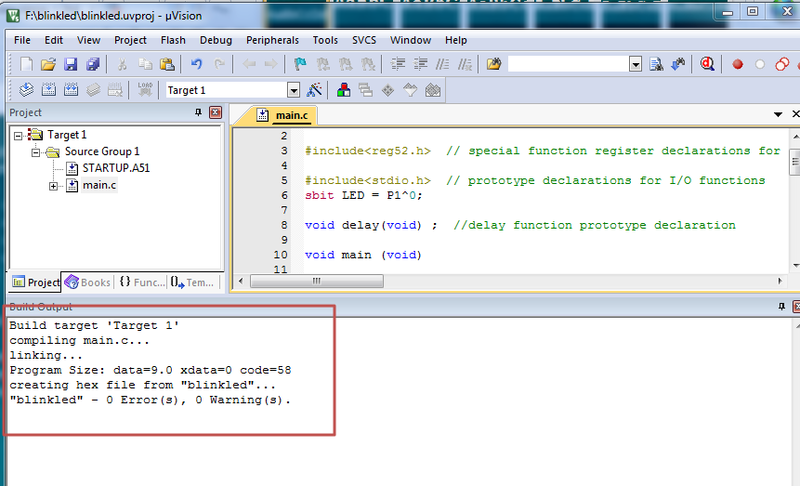 Ignore any SCK clock error which occurs due to un success full bit clock setting. 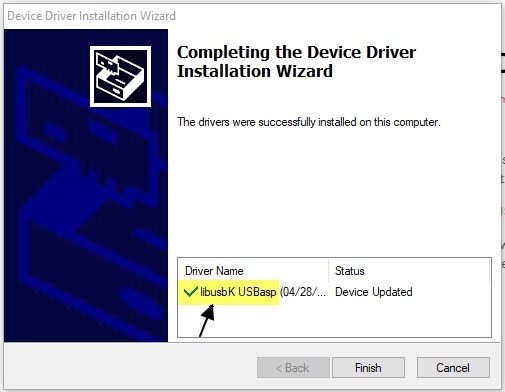 Installing USBASP drivers on Windows 8 or 10 is bit tricky. 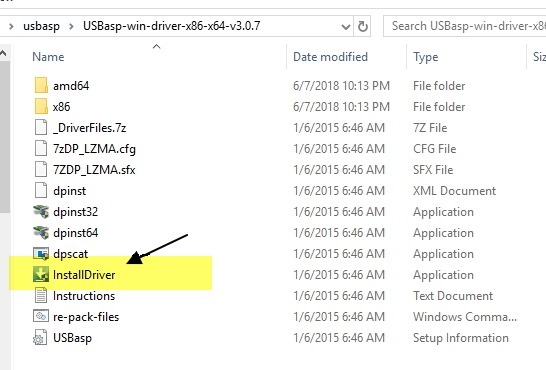 As these versions of Windows require DEVICE DRIVER VERIFICATION , they do not allow unsigned drivers like libusb. 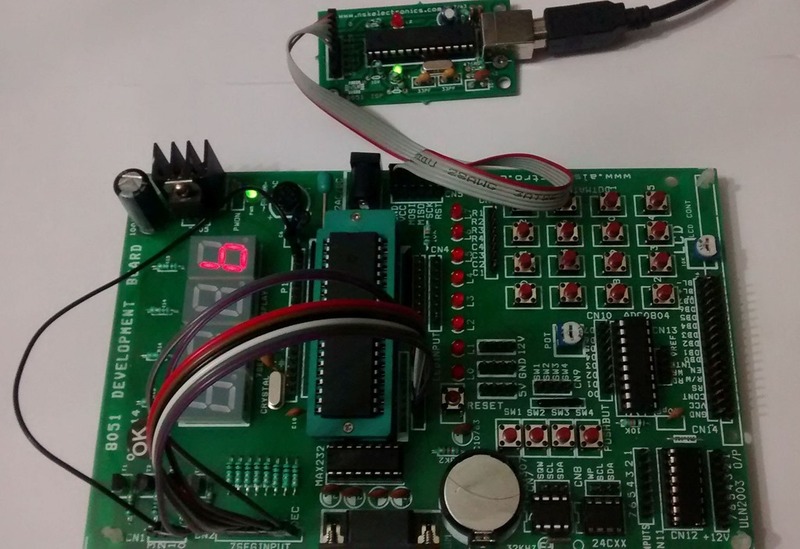 For programming 8051 or AVR you need this driver. 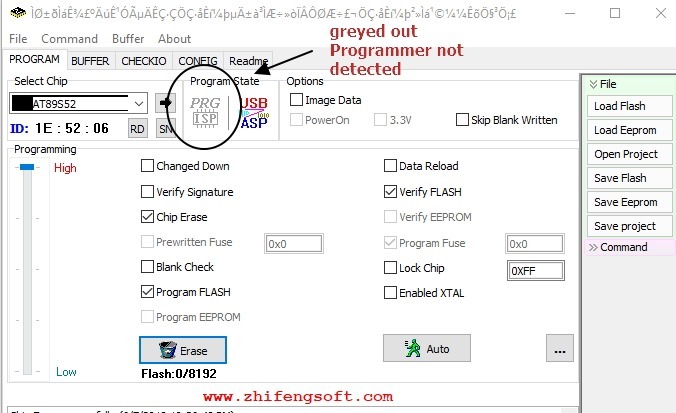 This method requires SHIFT+ RESTART of Windows to enter advanced troubleshooting where we disable signature verification .After this you can install the libusb driver. But in some laptops , this method fails on next Windows update. 2. 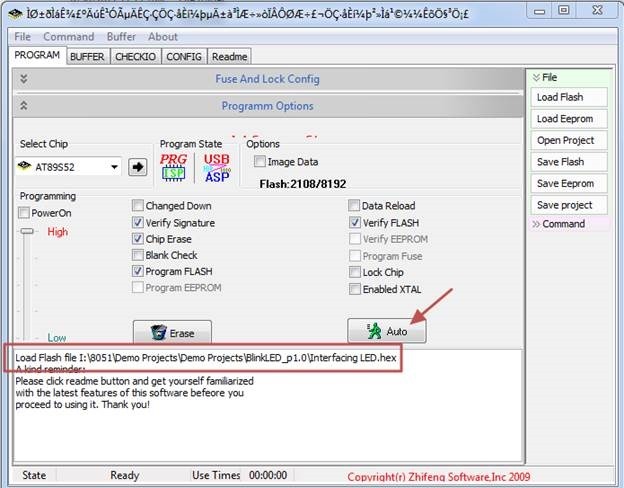 Install libusb drivers using ZADIG application. Zadig is meant to install a libusb compatible driver, for a device that does not yet have such a driver installed. (click on the dropdown to see all devices). You can also plug your USB device after Zadig is running, as the list is refreshed automatically. Its recommended to leave only the device you want to install a driver for, and unplug any other USB device. 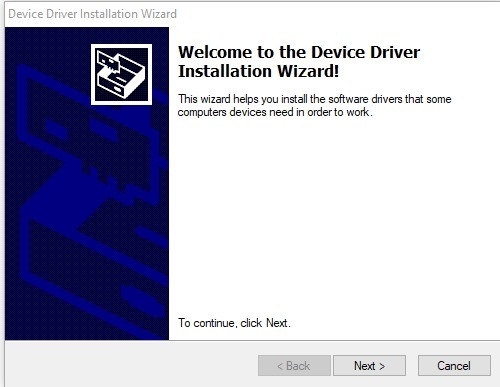 Once you are satisfied with the selection and device description, simply click the Install Driver Button. If you select the wrong device, Zadig will replace its driver. If wrong driver is replaced , then some of your USB devices like wireless mouse may not work. 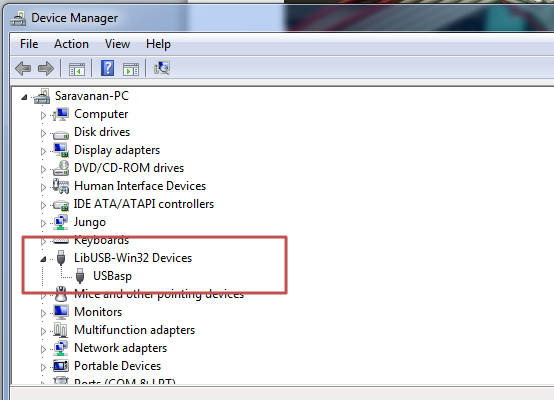 The USBASP windows driver was previously based on libusb-win32. The certificate on the base drivers have expired and the library has now been superseded by libusbK. 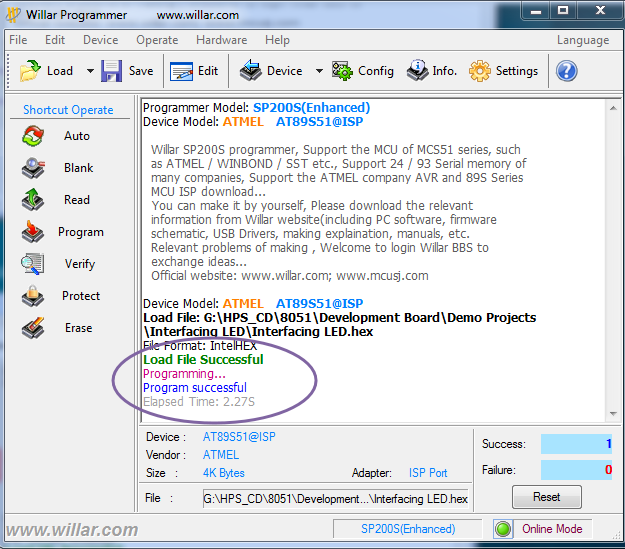 Following is the procedure to install protostack USBASP driver. 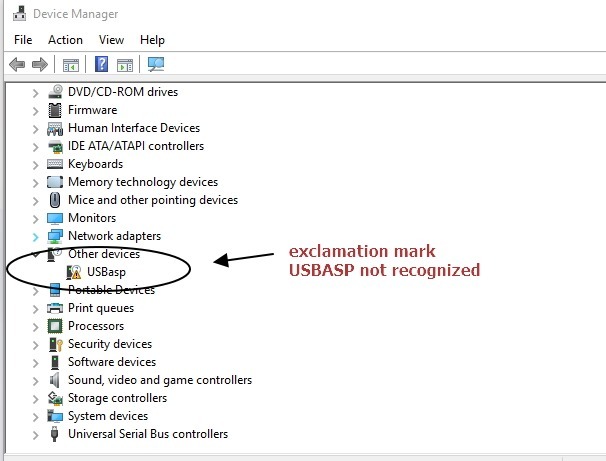 At first when you connect the USBASP hardware to PC & open the Device Manager you see an exclamation mark against USBASP indicating that drivers not installed. If you open the PROGISP application ( to load HEX file on to8051) ,you see the PRG ISP icon greyed out ,as the programmer is not yet detected. This driver should work with version of Windows XP right through to 8.1 and the version 10 . (both 32 and 64 bit editions). Because the driver is signed, there should be no need to disable driver certificate enforcement or use Zadig. Now ,open the PROGISP application to see the device ready. 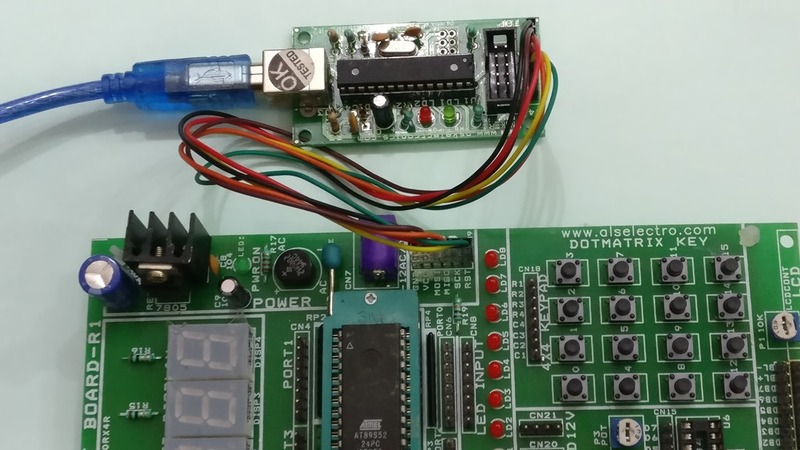 The popular 16 x 2 LCD can be interfaced with 89S52 in 4 bit or 8 bit mode. 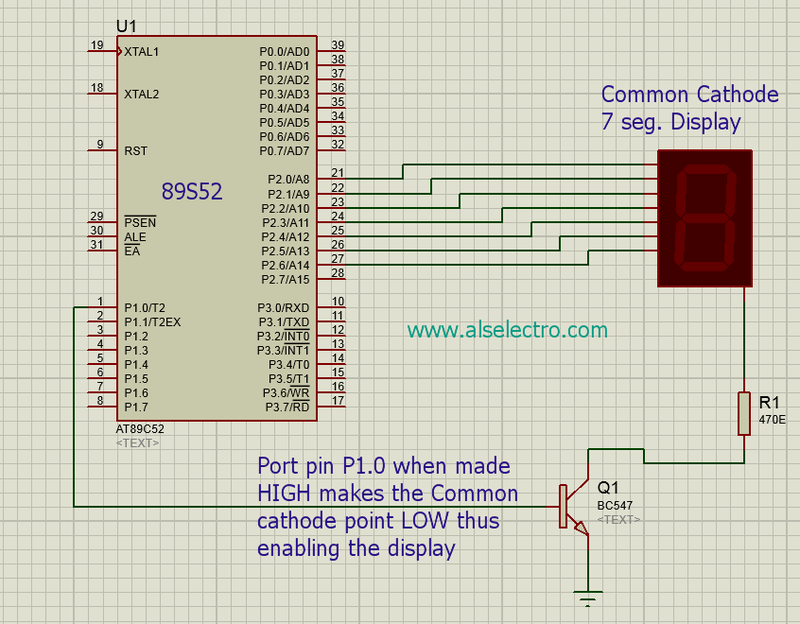 To save port pins of microcontroller , often the LCD is used in 4 bit mode. 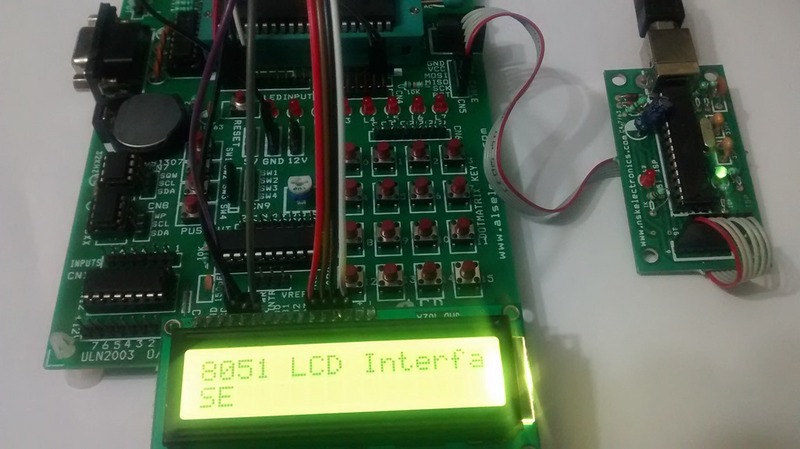 A header file defining all Functions related to LCD control is created and available for Download here . Including this header file into your project makes programming much easier. 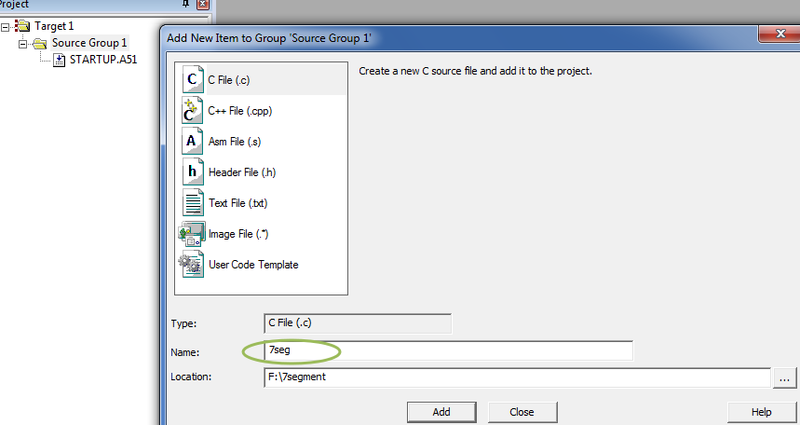 Provide a filename for the project & select the Target as AT89S52. 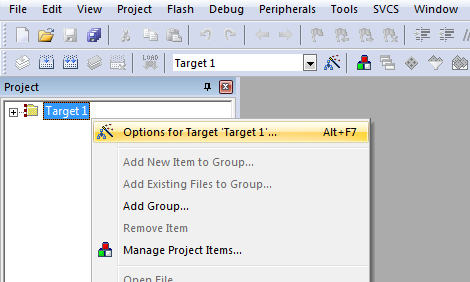 Click OK to get the Target1 on the project pane. 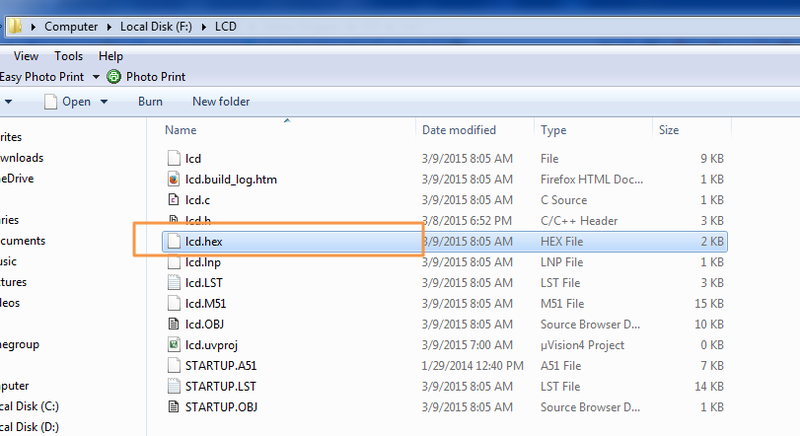 Now copy the downloaded lcd.h Header file & paste it to the project folder . 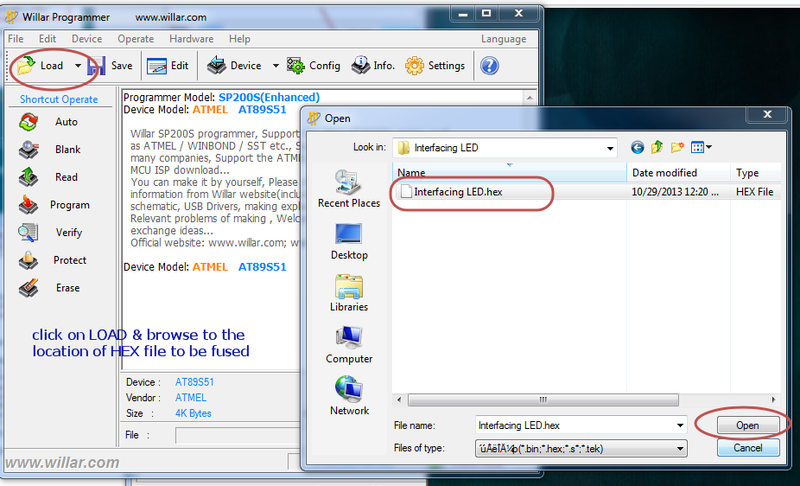 Browse to the lcd.h file you’ve added to the project & select it. 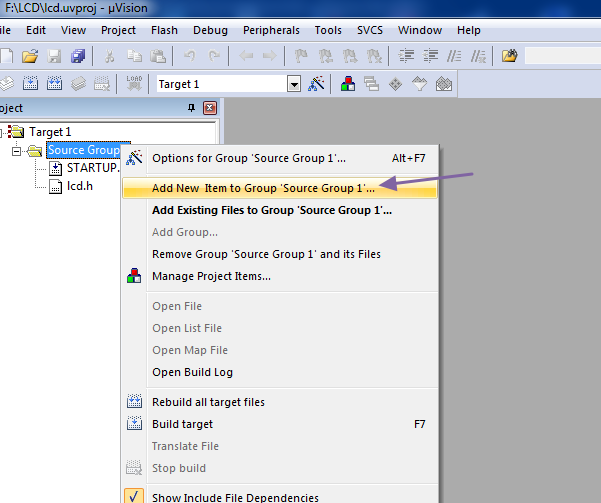 Now the Header file is included in to the project folder. 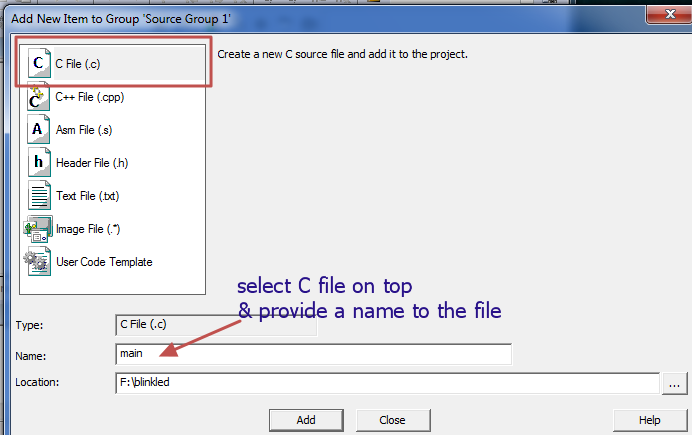 On the next screen select the first option “C File “ & provide a name to your C file. 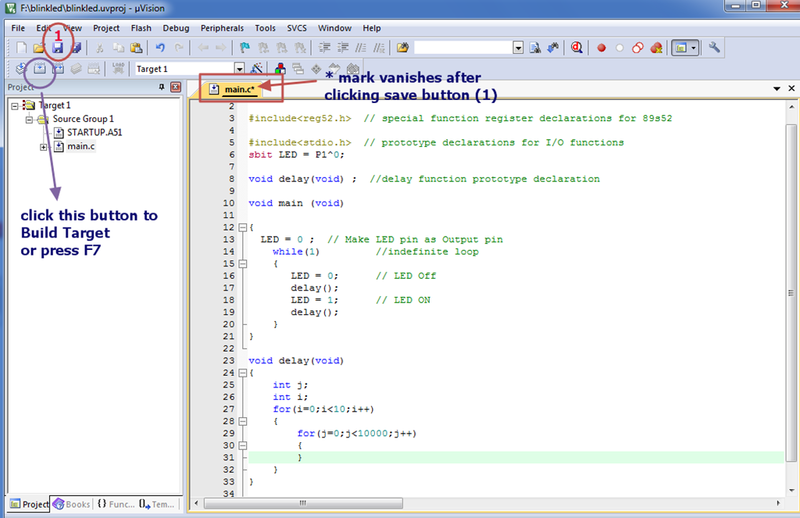 After feeding in the code , click the Save button. 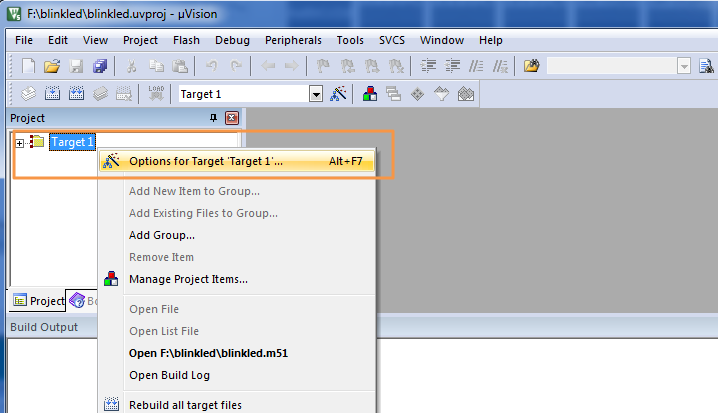 Now click F7 or the Build button to start building target. 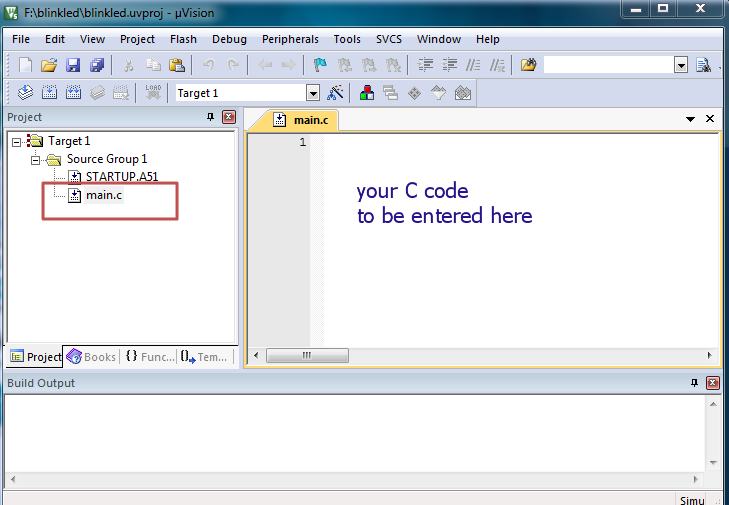 If the code syntax are correct , you get “Creating HEX file “ display on the Output window. 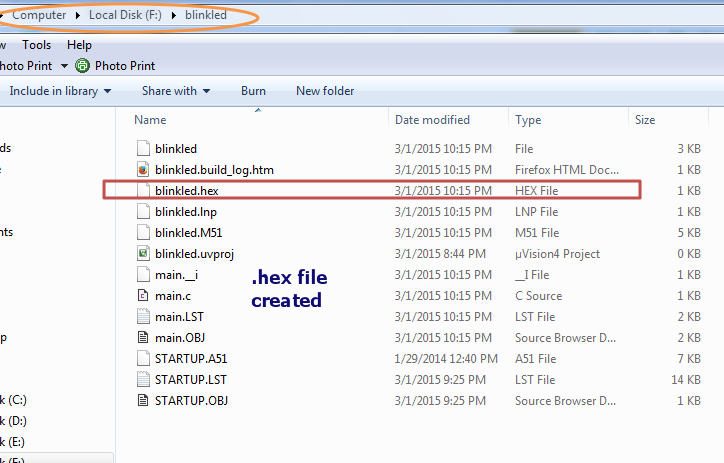 Now the HEX file is successfully created inside your project folder. Connect the ISP programmer to the Development board.Plug in the LCD module on to the LCD port connector. 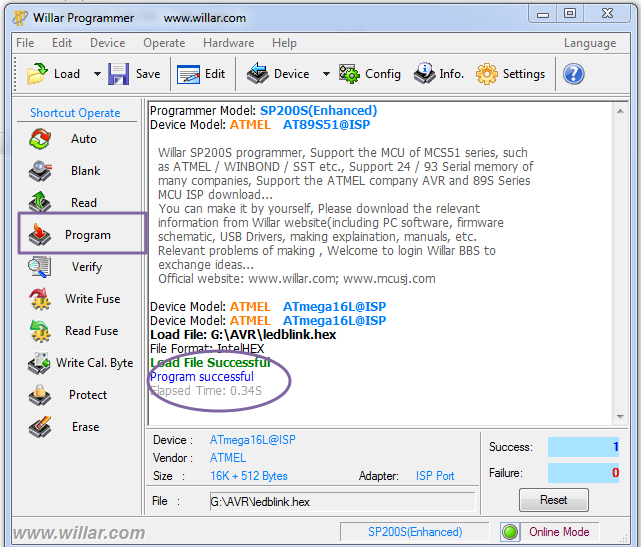 Connect the USB cable to PC & open the PROGISP software. 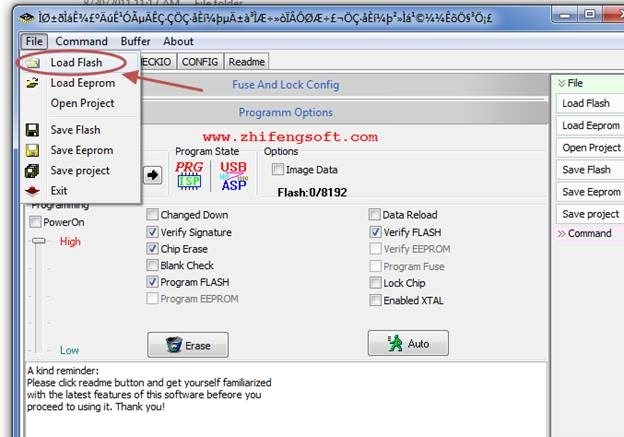 Click on File & “Load Flash “ .Browse to the location of the HEX file & select it. 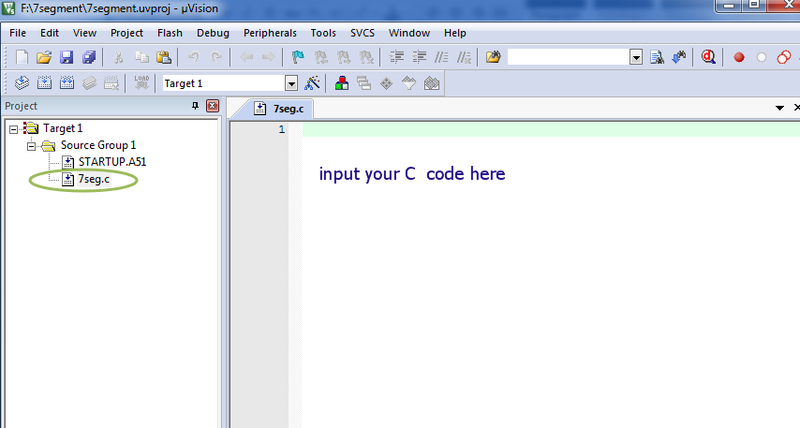 Click on AUTO to perform the programming. Now you can see the characters displayed on the LCD.You can adjust the small blue preset if nothing is seen on the LCD. 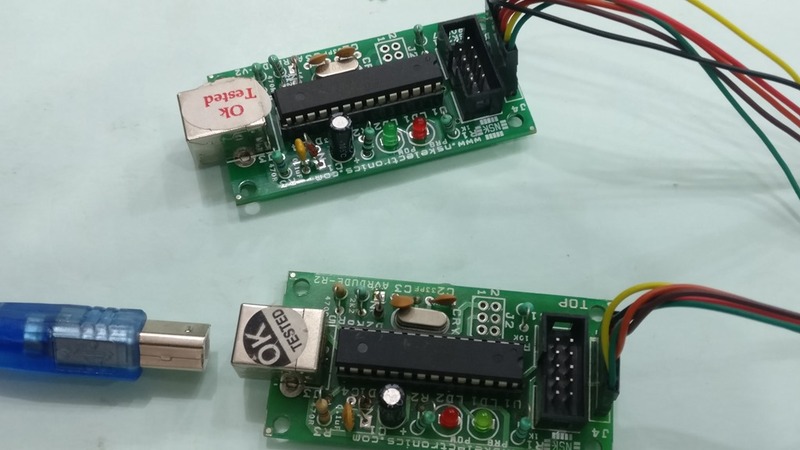 There are 2 types of 7 segment displays , Common Anode & Common Cathode.In this post we shall see how to interface a Common Cathode display with 89S52 Microcontroller. As the name indicates the cathode points of all segments are made common to GND .To make a segment Glow , the corresponding segment pin is made HIGH. The PORT pins P2.0 to P2.6 are connected to segments a through g. The dot pin can be left out. Following table explains how to arrive at the HEX value for displaying each Digit. For e.g , to display digit 1 , the segments b & c should be High & all others Low.This corresponds to 0x06 in Hex format. 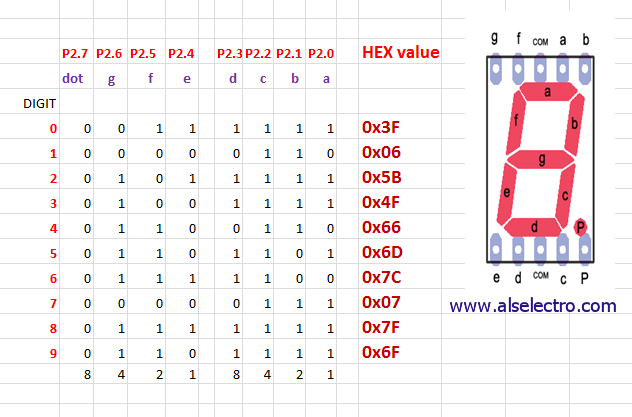 Similarly to display digit 0 , all segments , except g should be made High, which is hex 0x3F. For this demo , we do not use the Dot .Hence it is 0 for calculating all other digits. 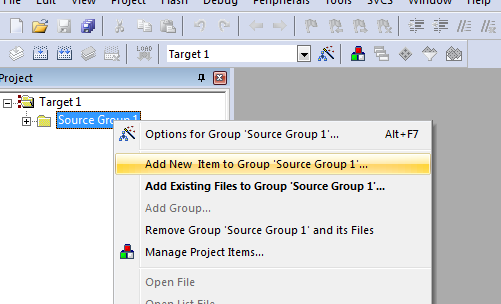 To start with create a folder say , F:\7segment to store project files. 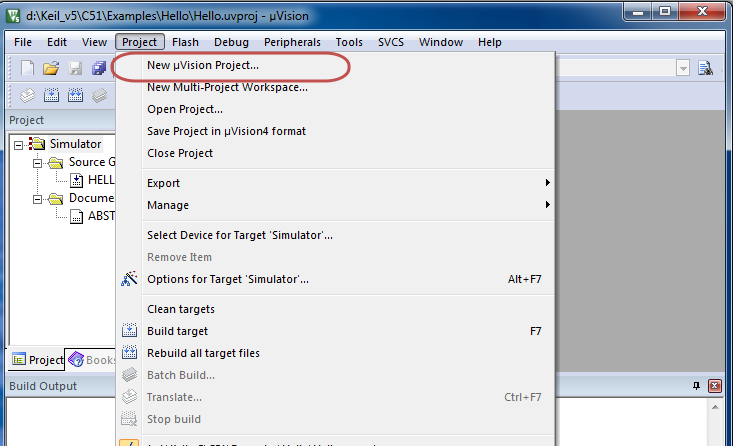 Open KEIL click on Project –> New uVision Project & browse to the location of the folder created.Provide a filename & Save. 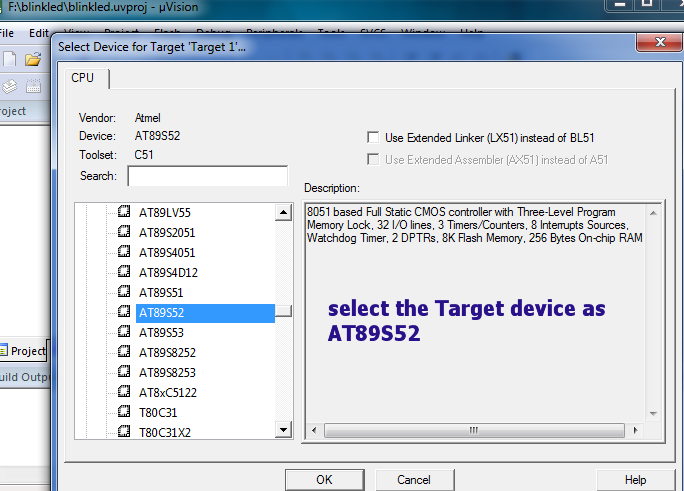 Select the Target Device as ATMEL AT89S52. 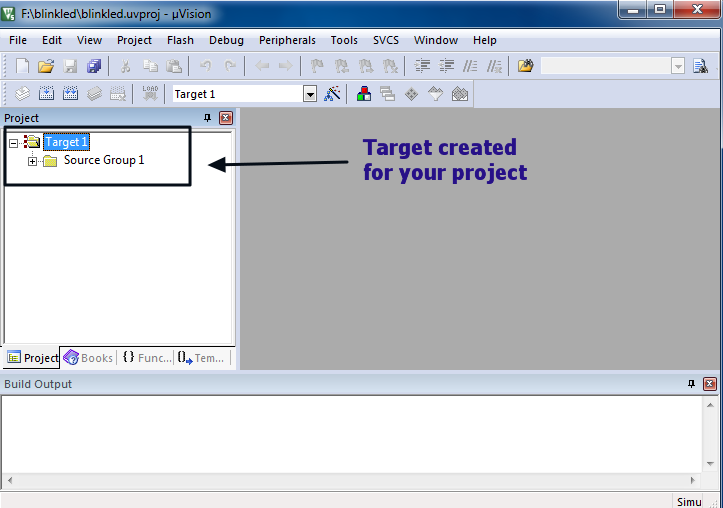 Target1 is created in Project file window of KEIL. 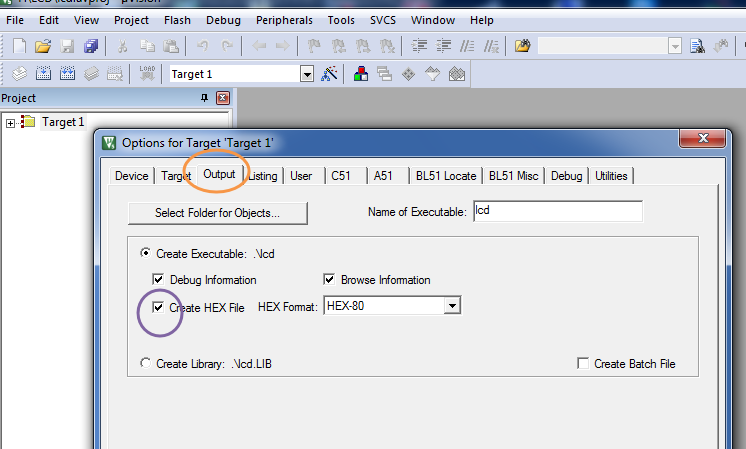 Check mark the box “Create HEX file” . 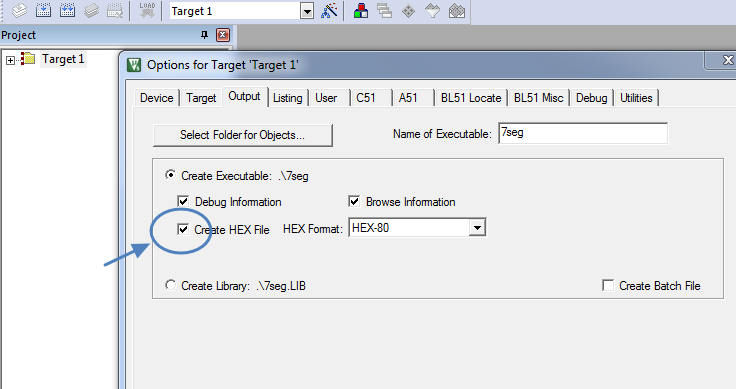 This step is important & if you forget check marking this box , no HEX file will be generated. You can see the .C file added to the project . First initialize all the segment hex values of the digits in an array. 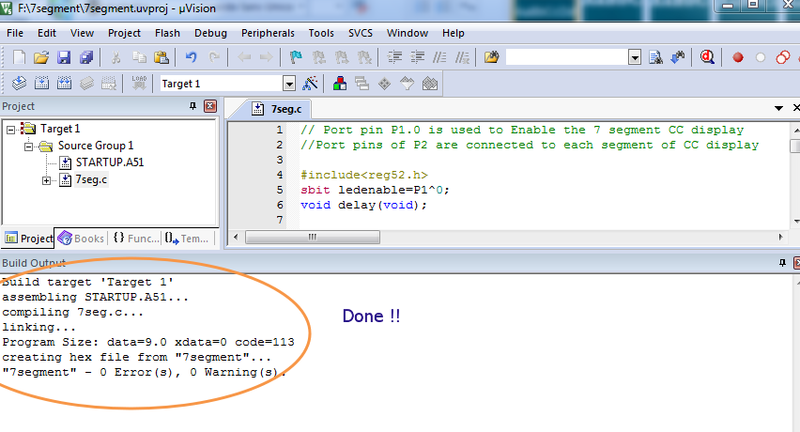 Now take for loop and assign array values to the PORT2 with some time delay. 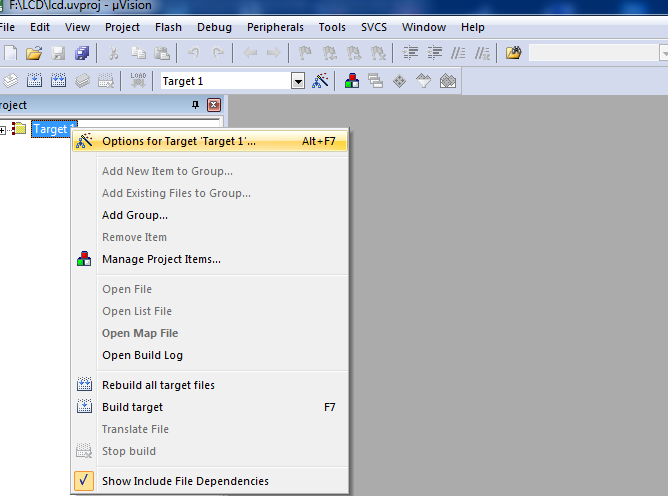 After Feeding in the code click on SAVE button & then F7 to build the project. If all syntax are correct , compiling will be successful. 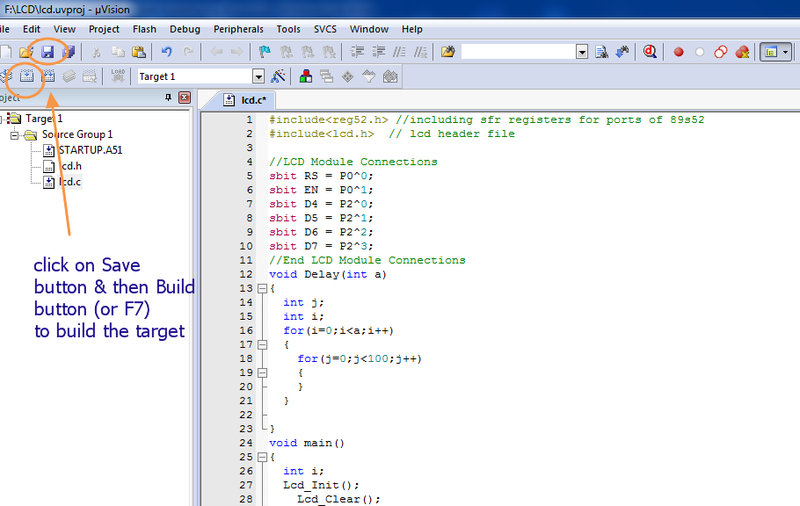 Inside the Project folder you can see the HEX file created.This is the file we’re going to fuse on the Target chip. 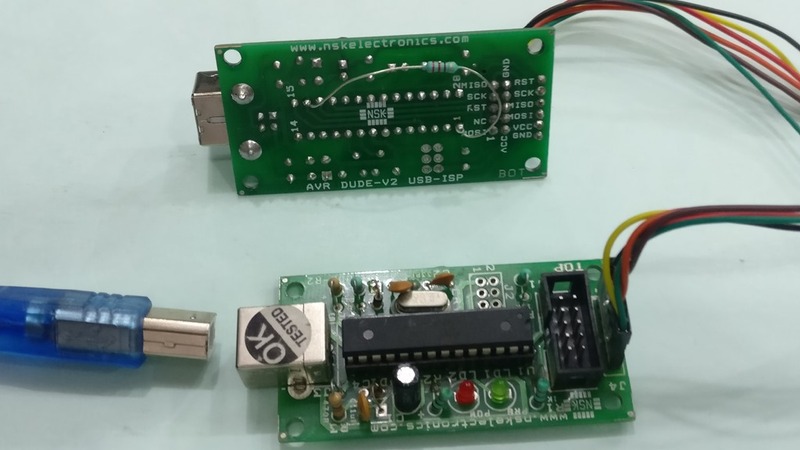 Connect the ISP board to the Development board & finally connect the USB cable to pc. 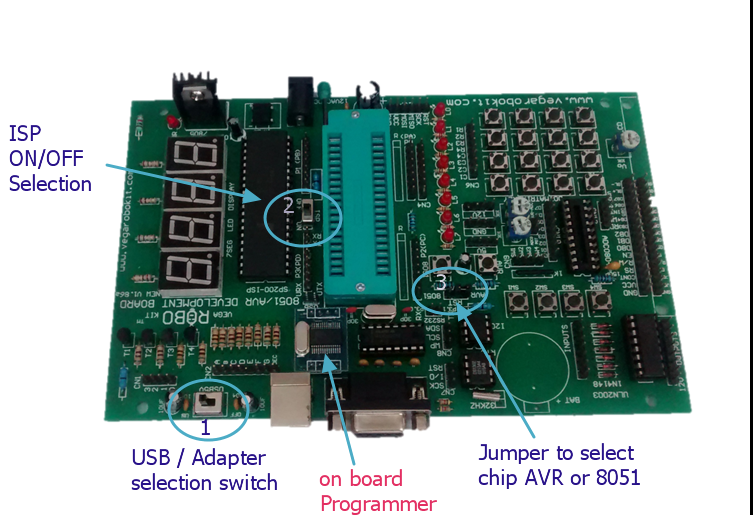 Open the PROGISP software .The PRG ISP & USB ASP buttons should be activated.If any one is greyed out then check for the drivers to be installed for the ISP board. 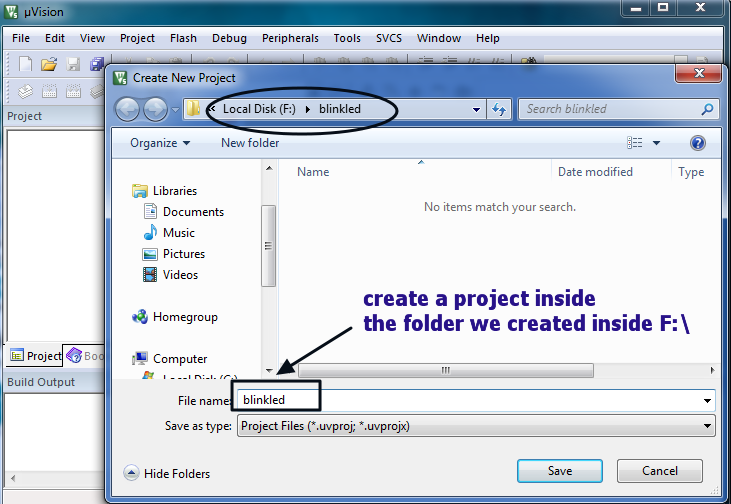 Click on FILE –> LOAD FLASH & browse to the location of the project folder where the HEX file was generated. Select the HEX file .Click on AUTO button to perform the programming. 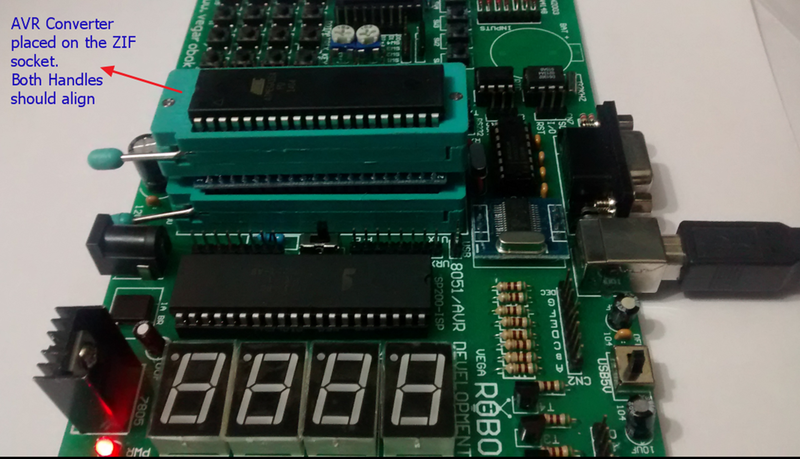 Once the HEX file is fused , you can see the result on the 7 segment display counting from 0 to 9. 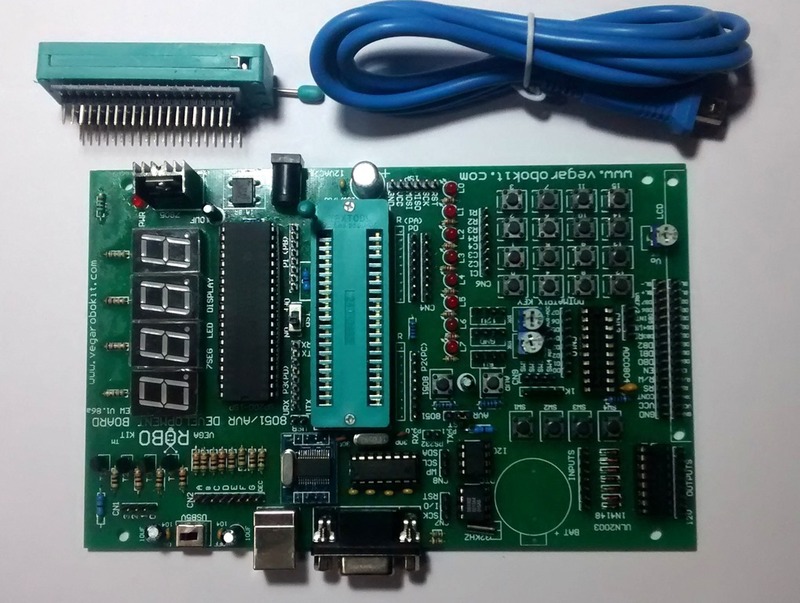 The 8051 development board can be used as a learners kit as well as a project board. An ISP programmer is required to fuse the HEX file on to the target 40 pin IC (89S 51 or 89S 52). 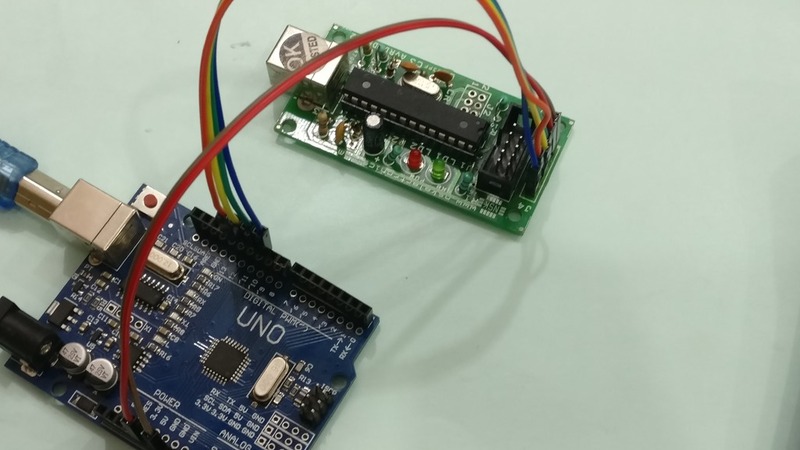 Care should be taken while connecting the ISP programmer with the Development board.Look out for the GND connection printed on the boards . 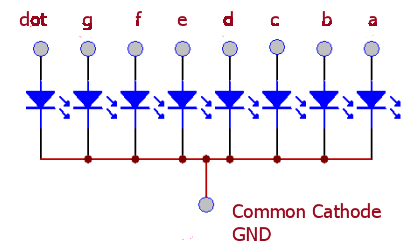 The GND of ISP must match the GND of Development board. 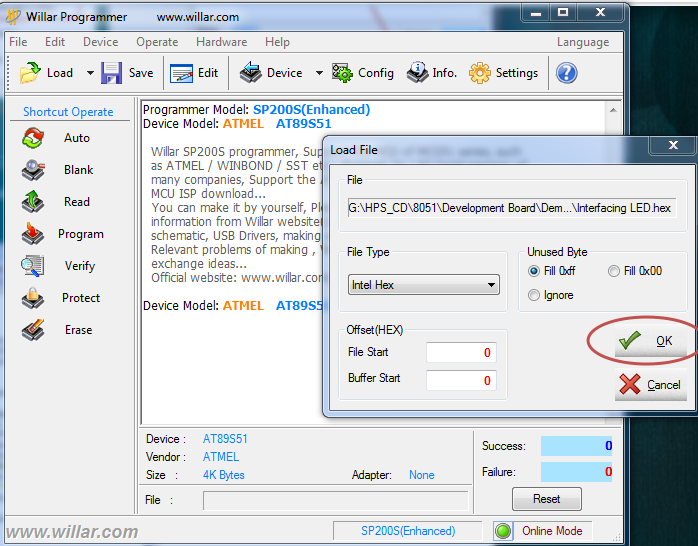 Connect the USB cable of ISP programmer to USB port of your PC. 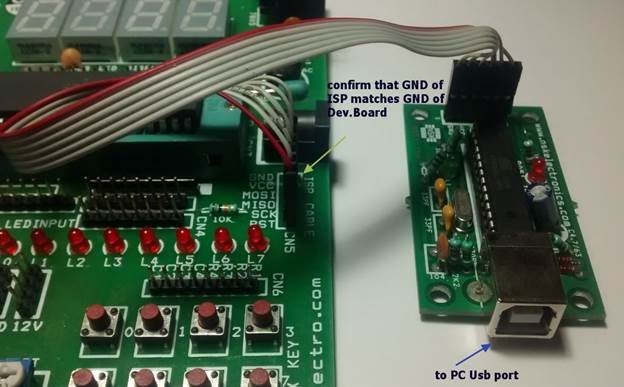 No external power is required for the Development board.Power is sourced from USB port of PC. 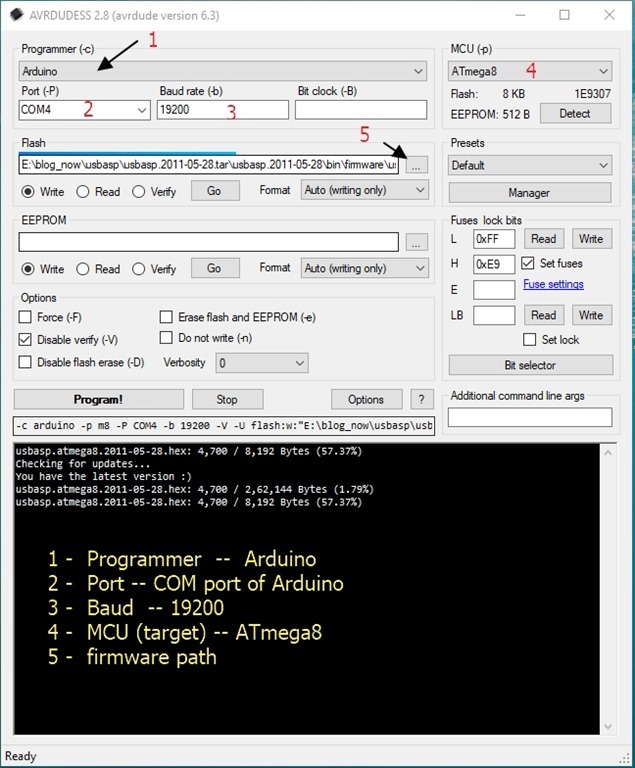 PROGISP is the software used to load the HEX file on to the target chip. 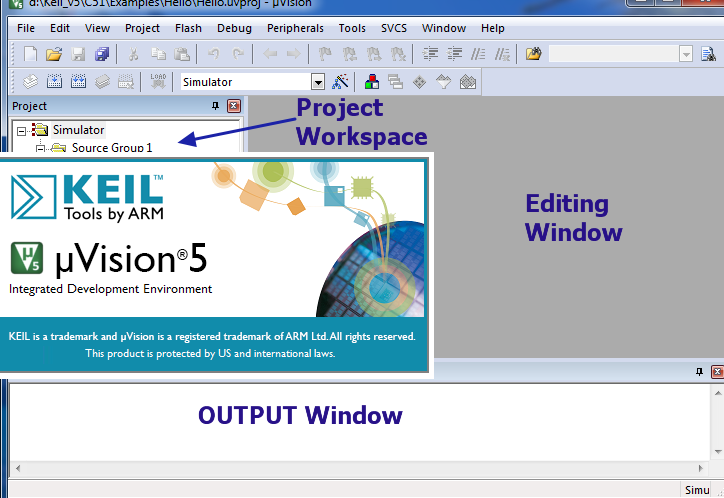 KEIL Microvision is the software to create HEX file using C code or Assembly language. 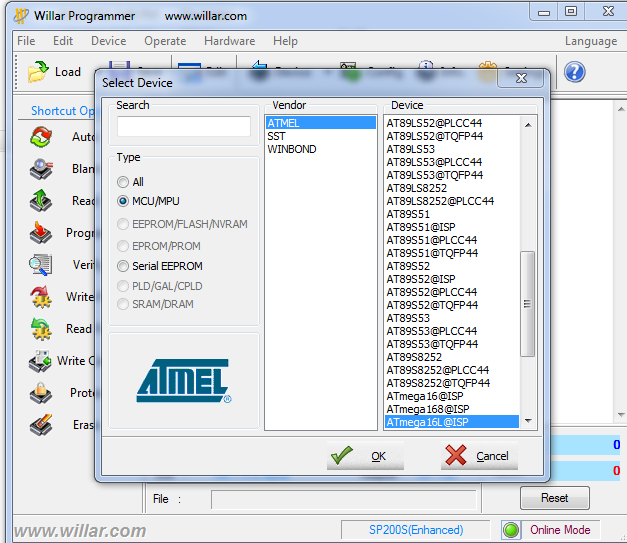 The drivers for the ISP Programmer is found inside the Drivers folder of PROGISP. 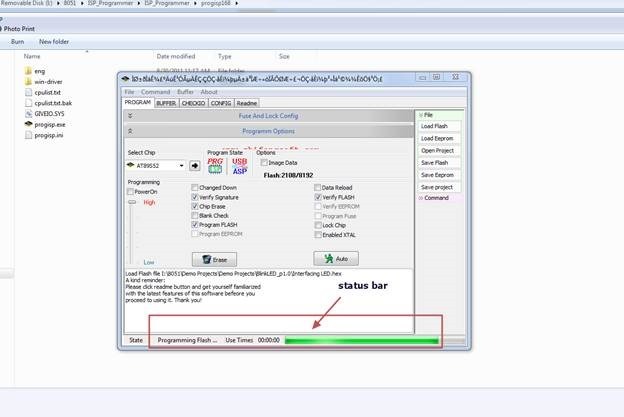 Open the DEVICE Manager of your PC while connecting the ISP programmer to USB port.If you get an exclamation mark against device , Update driver & browse to the location of Drivers inside PROGISP folder you’ve downloaded. 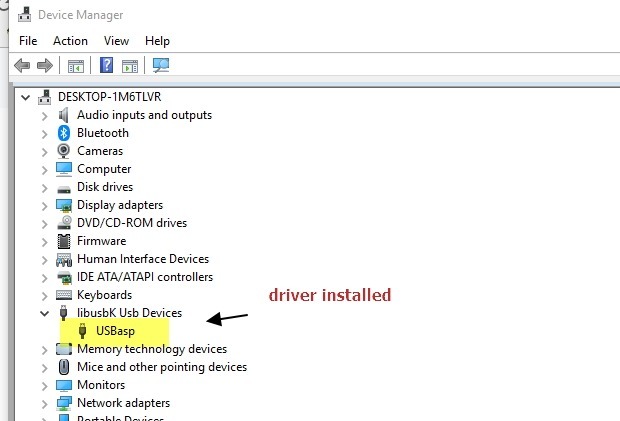 Once the Drivers are installed you get the USBasp under Device manager. The setup is now ready to load the HEX file. 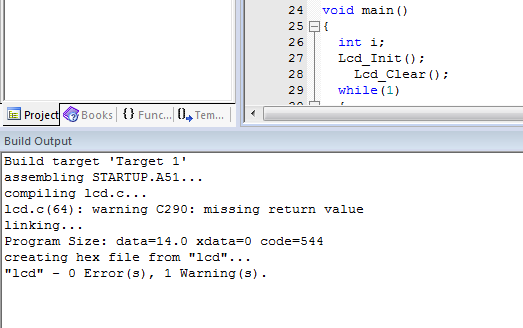 We use the PROGISP application to load the HEX file on to the target IC. No installation is required for this software , it’s a standalone one. Double click progisp.exe to open the application. 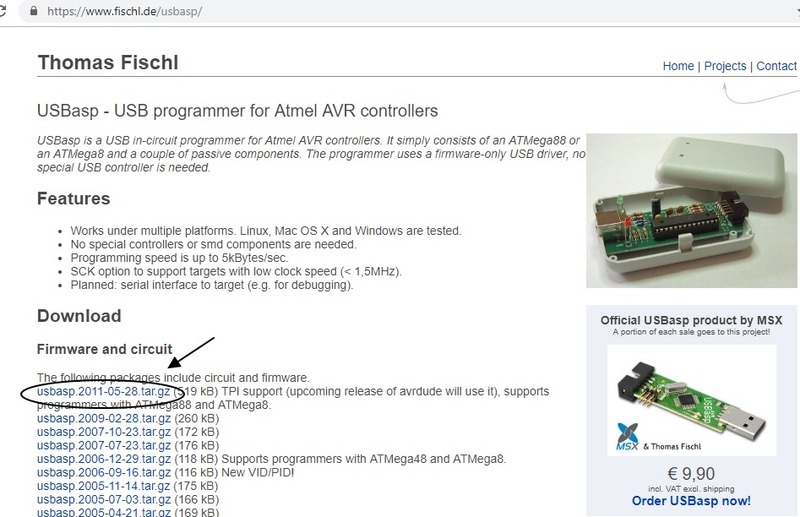 The PRG ISP & USB ASP buttons should be bright .If it’s greyed out , then check the USB cable connection & the driver installation. 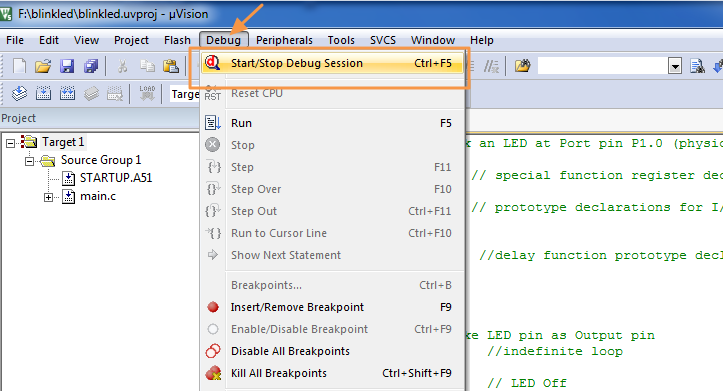 Select the target chip (here 89S 52) from the “Select Chip “ drop down menu. 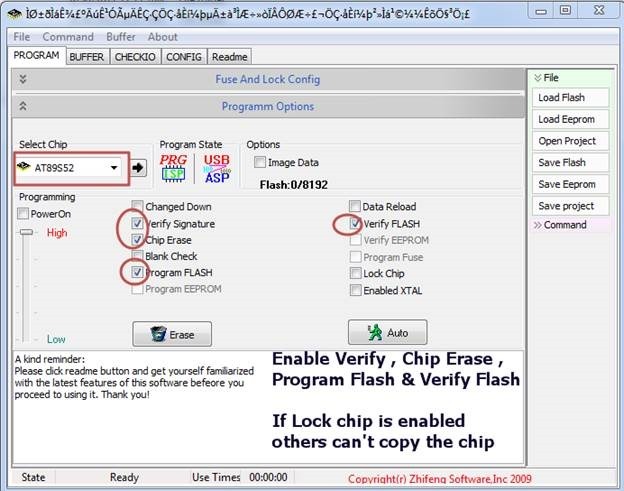 If you enable the LOCK CHIP button , others can’t make a copy of your chip. 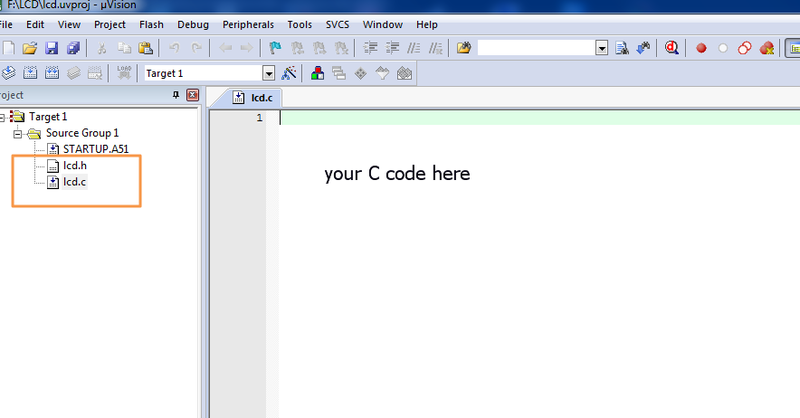 Click on FILE — > LOAD FLASH & browse to the location of the HEX file you’ve created using KEIL. 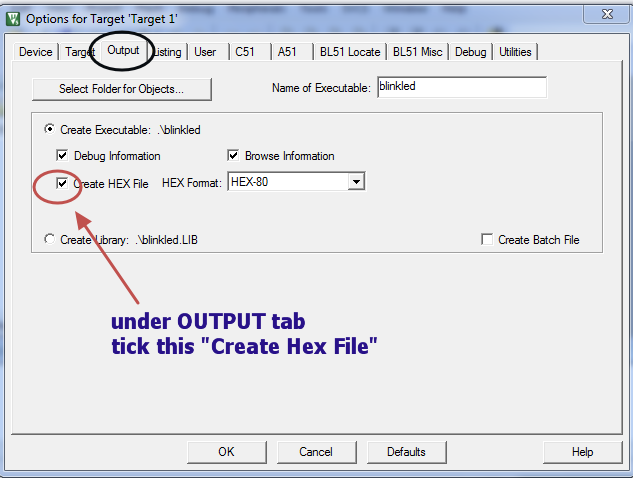 Once the HEX file is loaded , click on AUTO button to perform the tasks you’ve enabled. The status bar at the bottom indicates the progress of operation. Finally the HEX is successfully loaded on to the target chip. 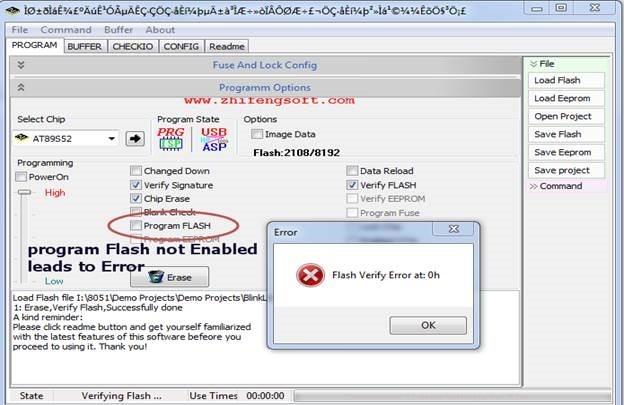 If the PROGRAM FLASH button is not enabled , you get Flash Verify Error while fusing. 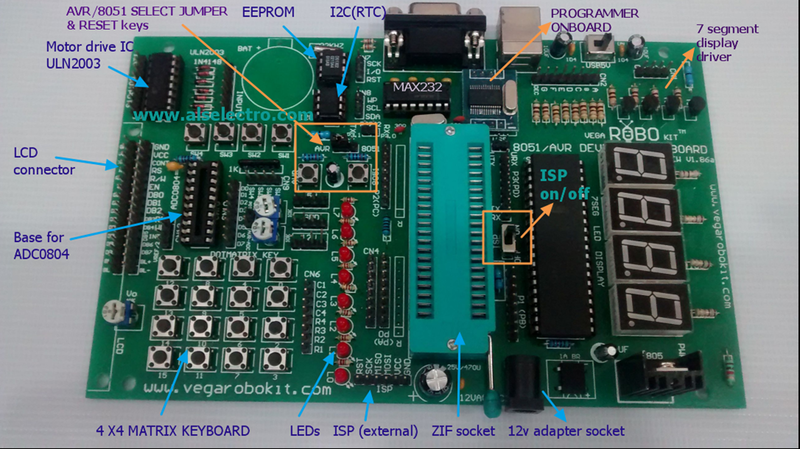 First time in India , VEGA ROBOKITS has engineered a development board universal to both AVR & 8051 ICs.The board has in built Programmer capable of programming both AVR & 8051 family ICs. A 40 pin ZIF socket is used as Target to hold the 8051 IC. Additional 40 pin ZIF socket with modified connection is provided to host AVR ICs.This additional ZIF socket should be placed over the on- board ZIF socket to use AVR ICs. To start with we shall see how to use this board for 8051 development. Select switch 1 to USB position ,if you connect the board to PC using A to B USB cable.Now the power is taken from USB itself. 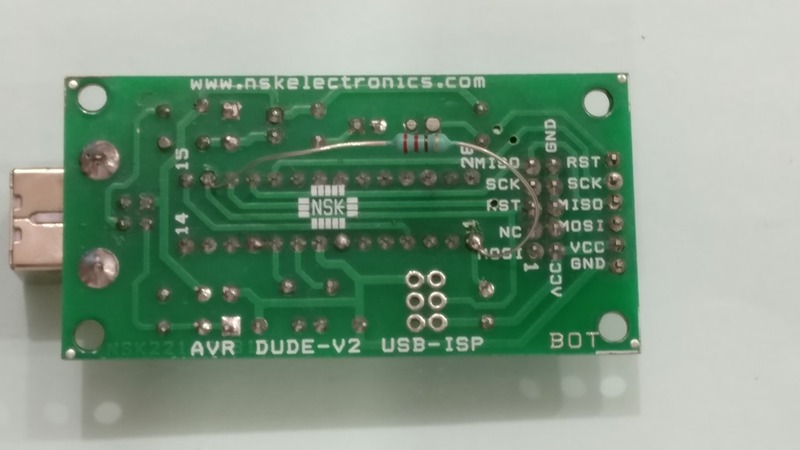 If this switch is selected to other side , the board needs an external 12v/1A adapter. Select the ISP switch (switch 2 near the middle of board) to ON position.This makes sure that you’re going to program the chip . Put the jumper (found on top of I2C EEPROM IC) on 8051 position. No installation is required.It is a standalone application. 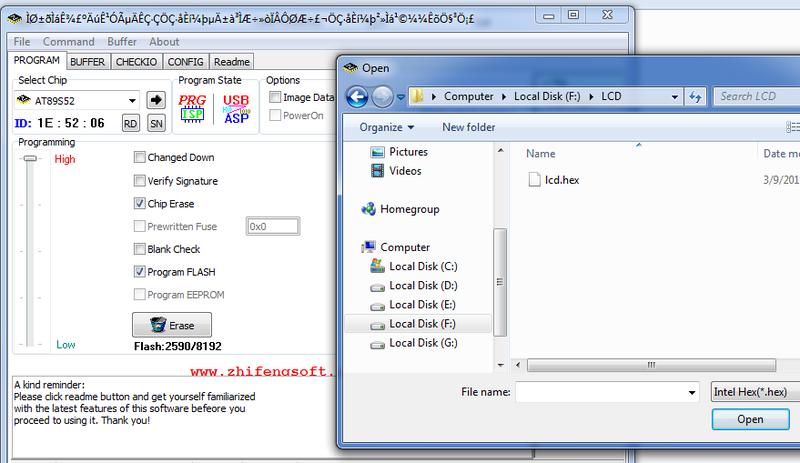 Unzip the driver file & double click on “PL2303_Prolific_DriverInstaller_v1.10.0 “ EXE file to install the drivers. Connect the USB cable of board to PC & open the DEVICE MANAGER. 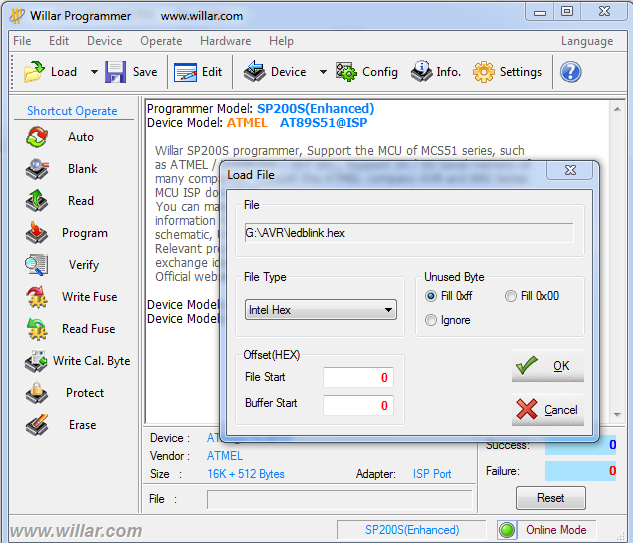 If the PORT allotted is within range 1 to 9 , you can start the WLPRO application and proceed to load HEX file. 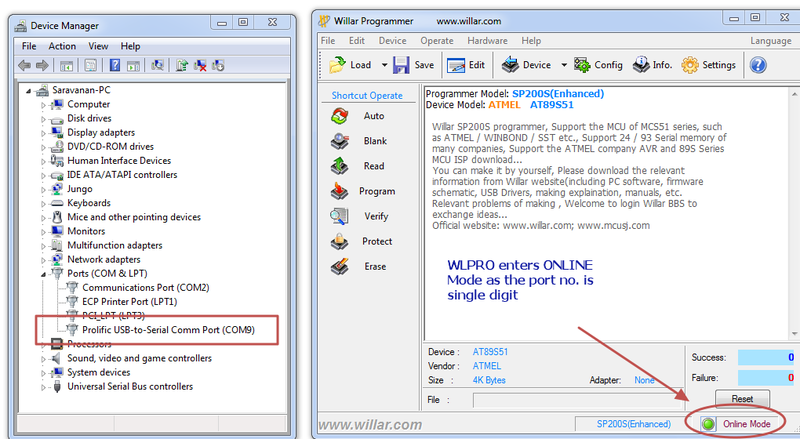 If the port allotted is a double digit , then WLPRO will enter DEMO mode .Only in ON LINE Mode you can load the HEX file. 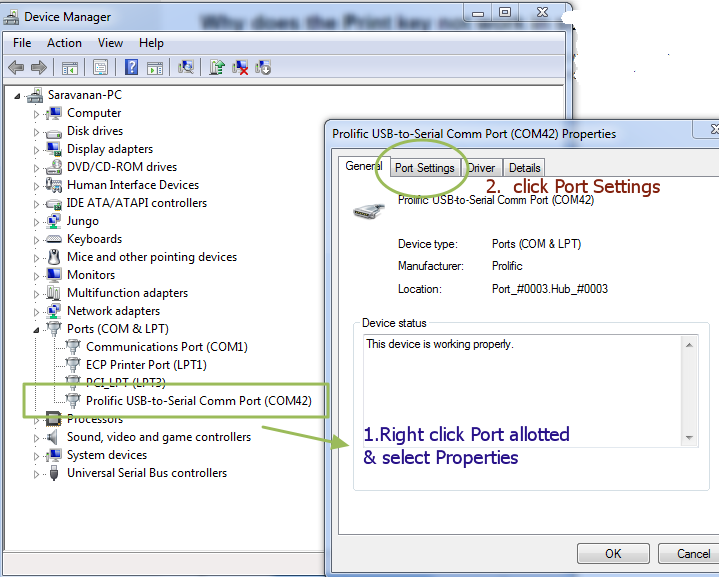 To solve this , RIGHT CLICK on the port allotted inside Device Manager & select PROPERTIES. Click on ADVANCED button under PORT SETTINGS. From the DROP DOWN you can select a PORT number between 1 & 9 & click OK. If the port number is not free , you can try overwriting the pre allotted port number & confirm. 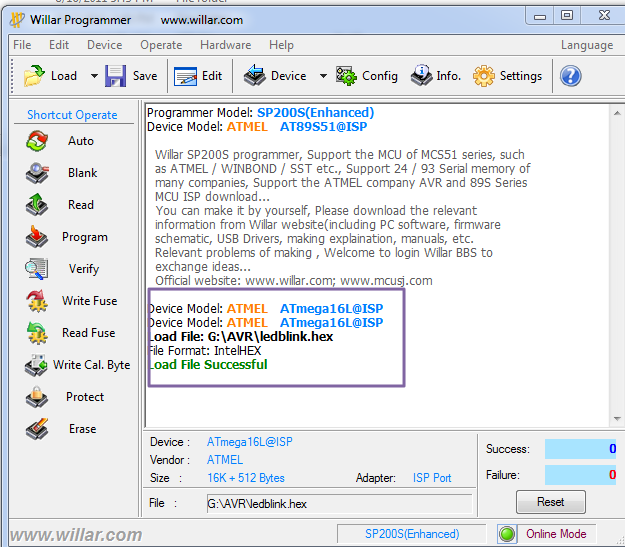 After PORT setting to single digit , open the WILLAR software . Now you can see ONLINE MODE at the bottom of screen. If you select plain AT89S51 , DEVICE ID ERROR will be returned while programming .So make sure to select the ISP version as device. 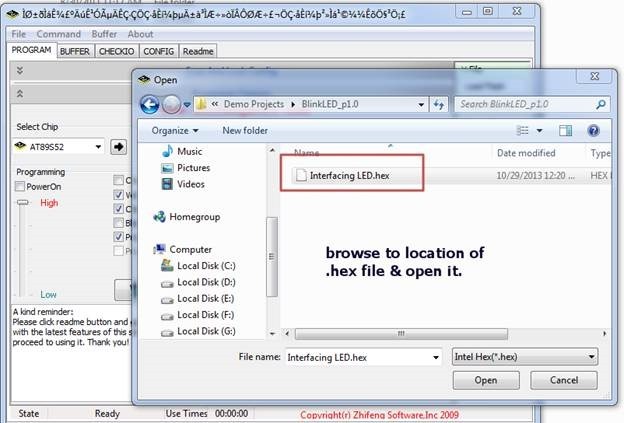 Click on LOAD button & browse to the location of the HEX file to be fused.Select the HEX file & then click OPEN. 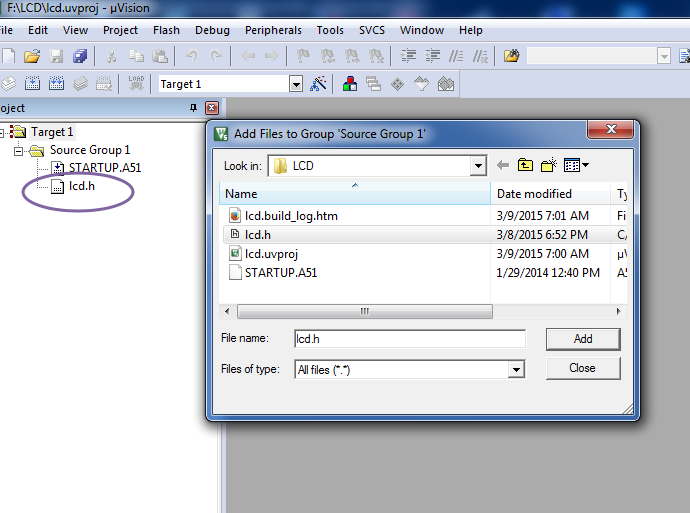 On the next LOAD FILE window leave the File type as “INTEL HEX” & CLICK ok.
You’ll see LOAD FILE SUCCESSFUL display. 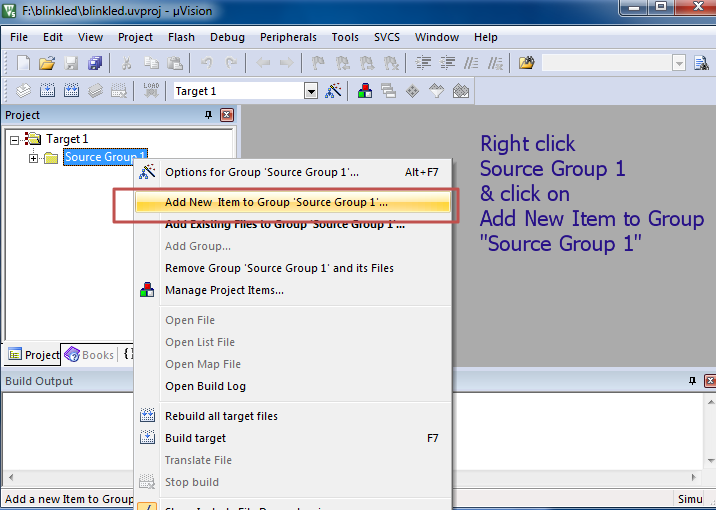 Now click on the PROGRAM button on the left pane. Programming is DONE & you get Program Successful display. If you click the AUTO mode button , all functions like Erase,Blank check ,Program,Verify & code copy Protect will be done automatically one by one. 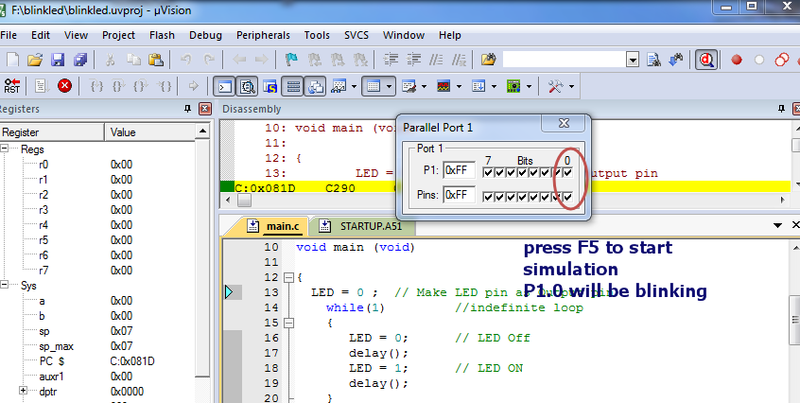 To test the program loaded , change the switch 2 to ISP OFF position .Push RESET button to see the result of blinking LED . Select the ISP (switch2) to ON position. 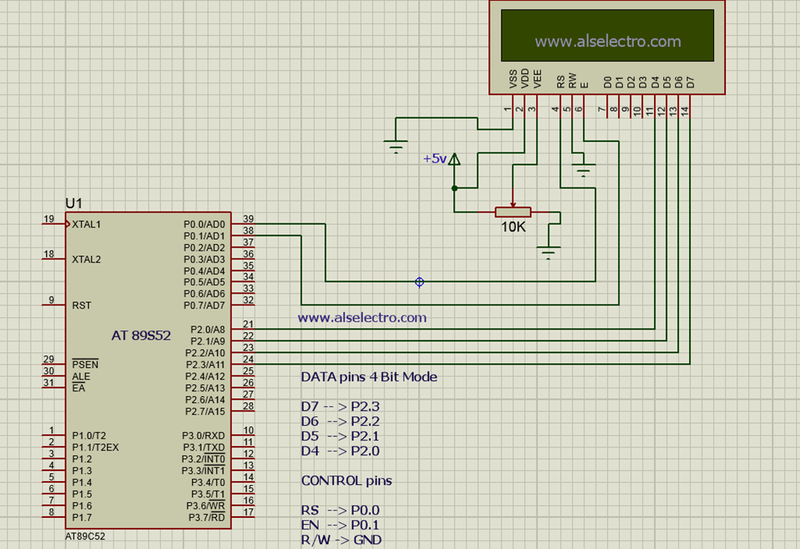 Put the Jumper on top of I2C chip to AVR position. Place the converter socket on the ZIF socket & lock it.Make sure that the handles of sockets match.Do not place the socket in REVERSE as it may damage the target IC. Ensure to select ISP version of IC & not the plain one. 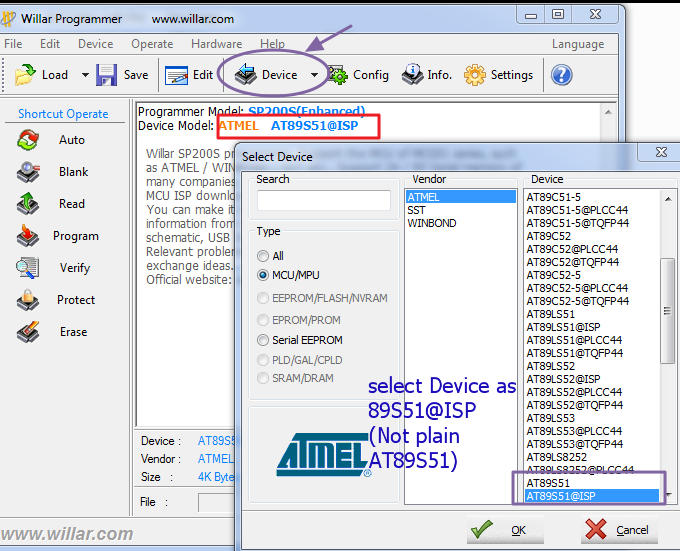 Select File type as INTEL HEX & click OK.
Click on LOAD & browse to the location of AVR HEX file . Click OPEN to LOAD the file. 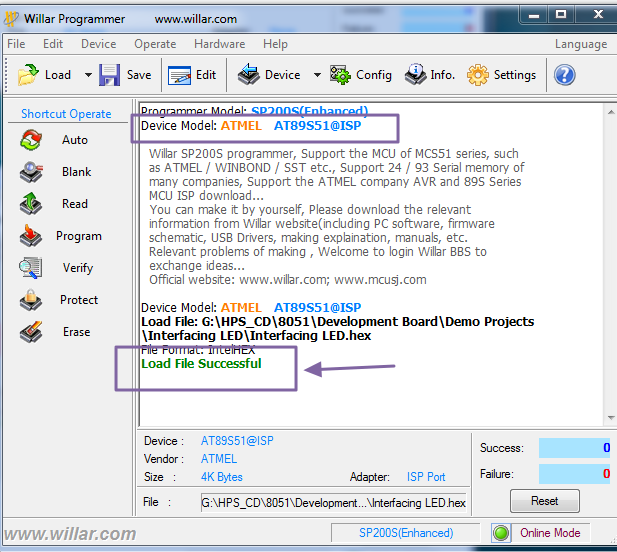 After LOAD SUCCESSFUL display click on PROGRAM to fuse the file.